Florence, Italy is by far my favorite place in the world!!! It is an absolute dream city that you could walk around for days and just get lost in it all. I have had the pleasure of visiting Florence twice and would love to return and spend a whole week walking around all of the museums, monuments, cathedrals, art galleries, boutiques and restaurants. Since it is a non-drive zone, it really has the feel of going back in time with the narrow streets, cobblestone sidewalks and carriages passing by. 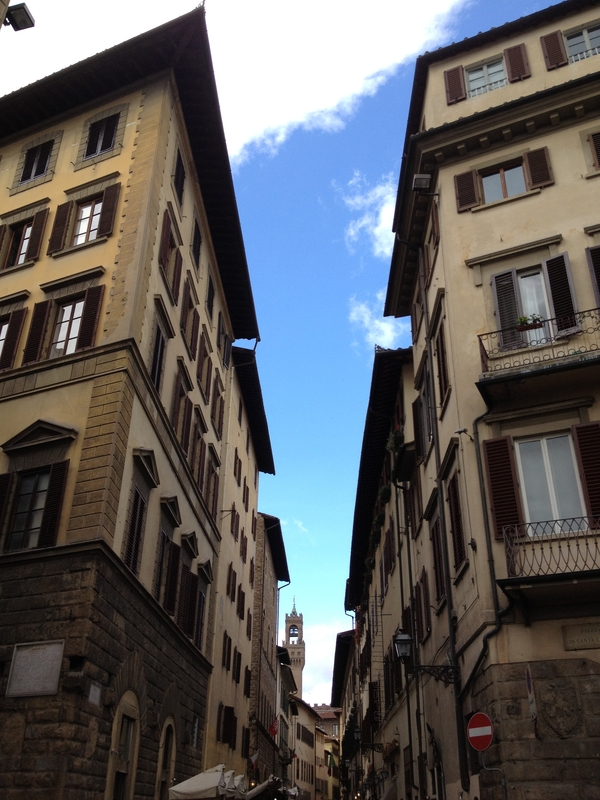 The pictures are absolutely inviting but Florence is a place that you must see for yourself. You will be in awe of the marble sculptures, cathedrals and the indescribable experience. Florence is the capital city of the Italian region of Tuscany and of the province of Florence. It is the most populous city in Tuscany. Florence has approximately 370,000 residents which increases to over 1.5 million in the metropolitan area. Florence is famous for its history!!! 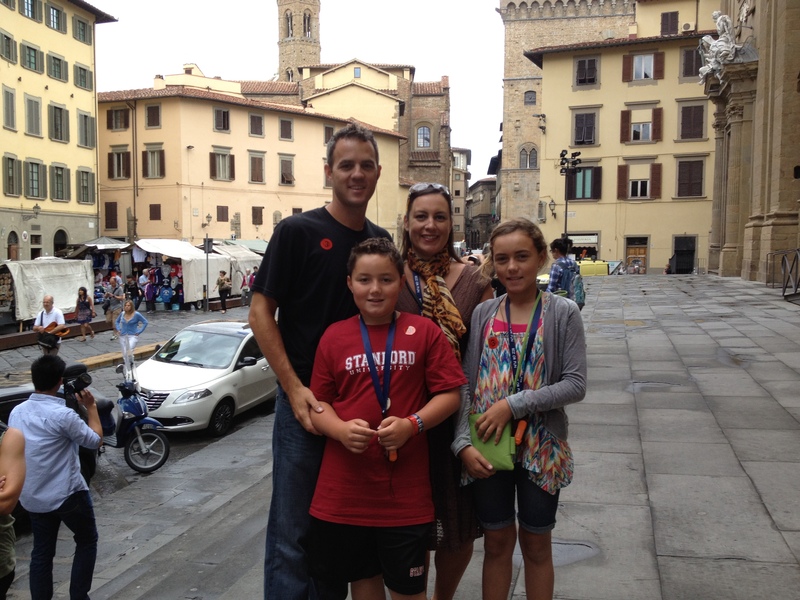 The first time I experienced Florence, I knew I had to bring my husband back because he is a history buff. Known for being the centre of medieval European trade and finance, Florence is one of the wealthiest cities of the time. Florence is the birthplace of the Renaissance. The historic centre of Florence attracts millions of tourists each year, and in 2009, Euromonitor International ranked the city as the world’s 72nd most visited. Forbes ranked Florenceas one of the most beautiful cities in the world! 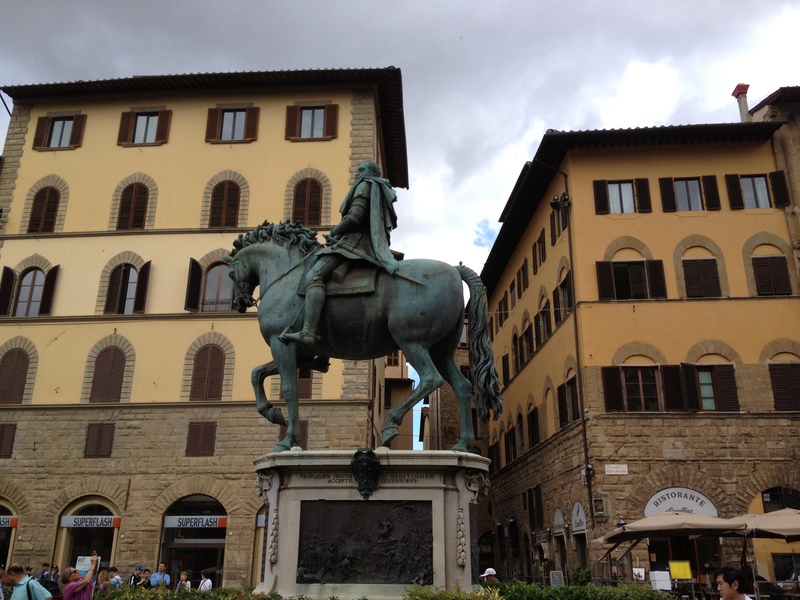 The city also contains numerous museums and art galleries, such as the Uffizi Gallery and the Pitti Palace. Bet you didn’t know that Florence is important in Italian fashion, as it is ranked in the top fifty fashion capitals of the world. The picture above is of the Facade of the Cathedral. The original façade was designed by Arnolfo di Cambio while attributed to Giotto. It all started as a mid 15th century ink drawing in 1587, which is currently on display in the Museum of the Opera del Duomo (located behind the cathedral). This façade was the collective work of several artists which was completed in its lower portion and then left unfinished. It was dismantled in 1587-1588 by the Medici court architect Bernardo Buontalenti. Some of the original sculptures are on display in the Museum Opera del Duomo. The competition for a new façade turned into a huge corruption scandal and it was left bare until the 19th century. In 1864, a competition was held to design a new façade and was won 7 years later by Emilio De Fabris. Work began in 1876 and completed in 1887. This neo-gothic façade in white, green and red marble forms a harmonious entity with the cathedral. The whole façade is dedicated to the Mother of Christ. Duomo meaning “Italian Cathedral” can be seen for miles. 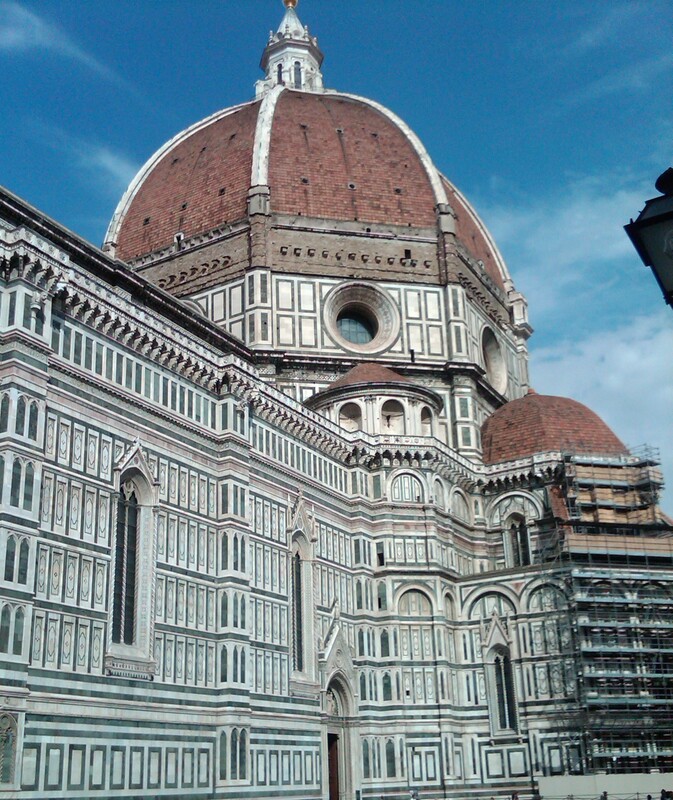 It is probably the most recognized structure in all of Florence. 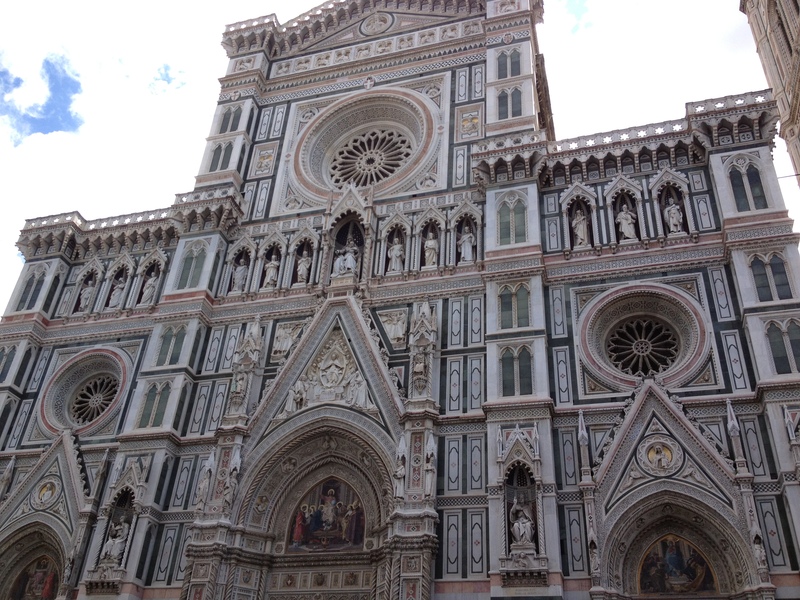 The Cathedral is located at Piazza Duomo in the historic center of Florence. The cathedral complex, located in Piazza del Duomo, includes the Baptistery and Giotto’s Campanile. We visited the cathedral from the outside, but tours are available. Guided visits are available for the Duomo (€9), its dome, (€11, includes entrance fee), the cathedral terrace (€15, also includes the dome), and Santa Reparata (€9, includes entrance fee). All guided tours last approximately 45 minutes to one hour. History of the Dome~ In the beginning of the 15th century, after a hundred years of construction, the Florence Cathedral was still missing its dome. The basic features of the dome had been designed by Arnolfo di Cambio in 1296. In 1367, the architectural choice of Neri di Fioravante’s model was chosen over a competing one by Giovanni di Lapo Ghini which was one of the first events of the Italian Renaissance. At the time, the use of buttresses (structure made of brick or stone built against a wall for support or reinforcement) was forbidden in Florence. In August 1418, the Arte della Lana (the wool guild of Florence) announced a structural design competition for erecting Neri’s dome. Filippo Brunelleschi, a master goldsmith, was chosen. The dome posed many technical problems. 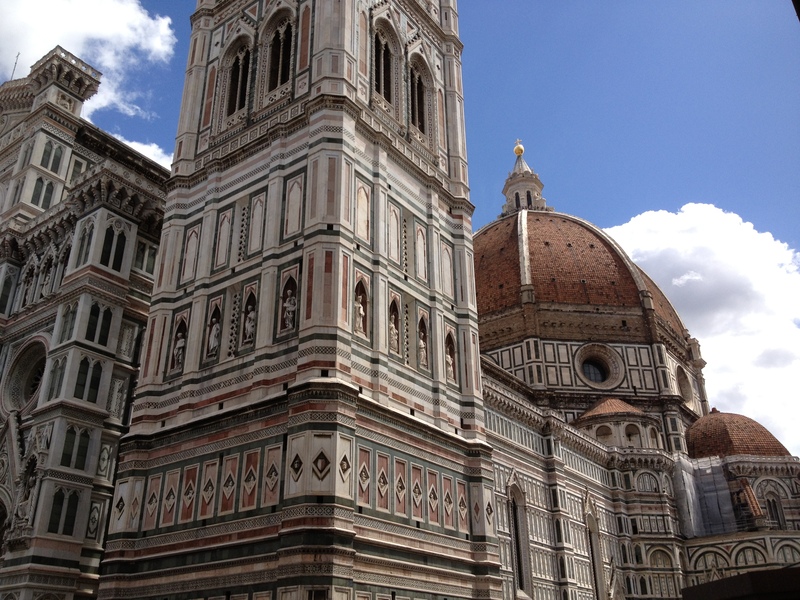 Brunelleschi researched the great dome of the Pantheon in Rome for solutions. There was not enough timber in Tuscany to build the scaffolding and forms.Brunelleschi chose to follow such design and employed a double shell, made of sandstone and marble. He constructed a wooden and brick model with the help of Donatello and Nanni di Banco which is currently displayed in the Museo dell’Opera del Duomo. The model served as a guide for the craftsmen. Construction of the dome started in 1420 and was completed in 1436. The dome was the first octagonal dome in history to be built without a temporary wooden supporting frame. 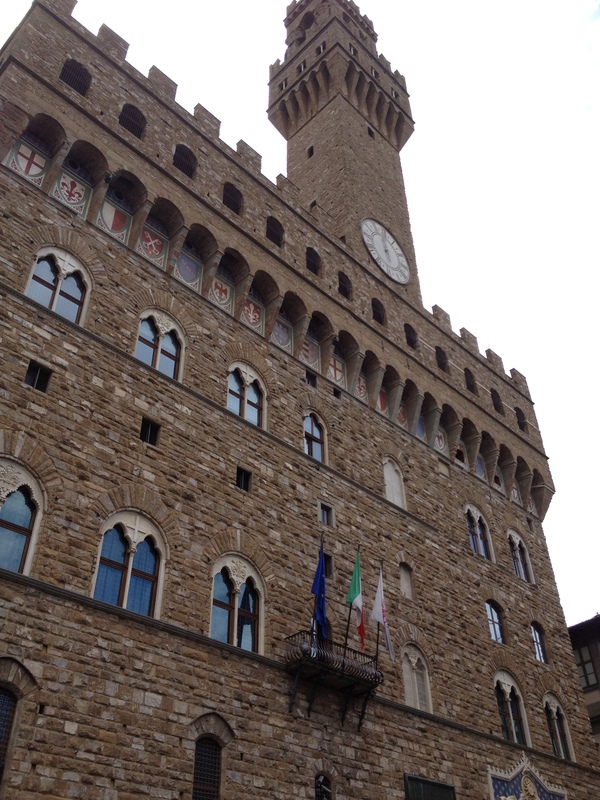 The Palazzo Vecchio meaning “Old Palace” is the town hall of Florence. The massive, Romanesque, solid cubicle shaped building with a walled fortress-palace is considered to be the most impressive town hall in all of Tuscany. The location of the fortress-palace is what makes it one of the most significant public places in Italy. It overlooks the Piazza della Signoria with the replica of Michelangelo’s David statue as well as the gallery of statues in the adjacent Loggia dei Lanzi. The Tower includes three bells, the oldest one was cast in the 13th century. How did the building come about? The commune and people of Florence decided to build a palace in 1299 that would be worthy of the city’s importance and would provide security to the magistrates. Arnolfo di Cambio, architect, constructed Palazzo Vecchio so that the Uberti family (rebels of Florence and Ghibellines) homes would never be rebuilt on the same location. The tower contains two small cells, which imprisoned Cosimo de’ Medici in 1435 and Girolamo Savonarola in 1498. The tower is named after its designer Torre d’Arnolfo. The large, one-handed clock was originally constructed by the Florentine Nicolò Bernardo, but was replaced in 1667 by a clock made by Vincenzo Viviani. Most of Palazzo Vecchio is now a museum but remains the symbol of local government housing the office of the mayor of Florence and it is the seat of the City Council since 1872. The Perseus with the head of Medusa is quite a violent and interesting sculpture which was created by Benvenuto Cellini’s 1545. The sculpture sits on a square base with bronze relief panels located in the Loggia dei Lanzi of the Piazza della Signoria in Florence, Italy. The piece was introduced to the public on April 27, 1554. Michelangelo’s David, Bandinelli’s Hercules and Cacus, and Donatello’s Judith and Holofernes were already in the piazza. What is with the snakey head? 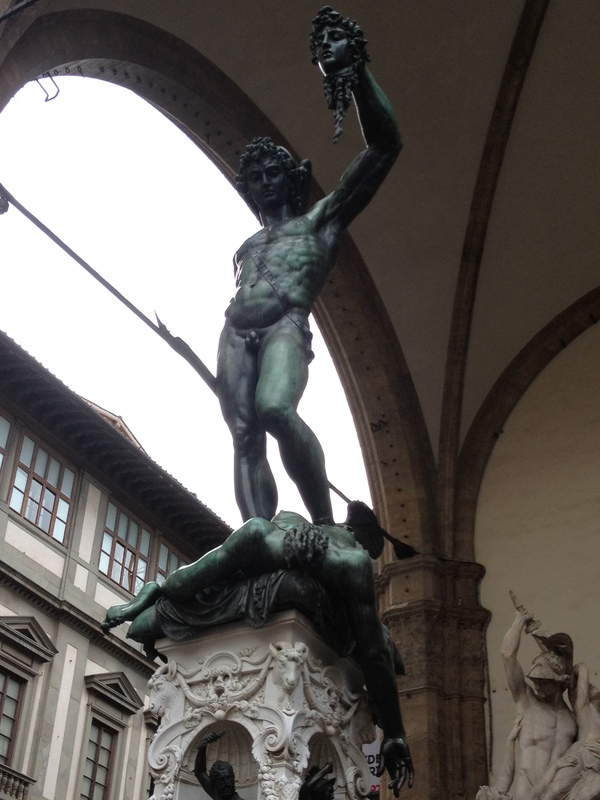 The sculpture is about the mythological story of Perseus beheading Medusa. Medusa was a hideous woman-faced Gorgon whose hair was turned to snakes and anyone that looked at her was turned to stone. In the sculpture, Perseus stands naked except for a sash and winged sandals, standing on top of Medusa holding her snakey head in his hand. The body of Medusa spews blood from her severed neck. The bronze sculpture is surrounded by three huge marble statues of men: Hercules, David and later Neptune.Cellini was the first sculptor to introduce bronze in Perseus and the head of Medusa in the piazza. The Loggia dei Lanzi (the arches above the sculptures in the picture) consists of wide arches open to the street. The wide arches appealed so much to the Florentines, that Michelangelo even proposed that they should be continued all around the Piazza della Signoria. The Loggia dei Lanzi is an open-air sculpture gallery of antique and Renaissance art including the Medici lions. I find it interesting how the bronze sculptures appear green in color. Why? Bronze alloys contain copper. When bronze oxidizes (comes in contact with water and oxygen) or “rusts”, the process causes the bronze to turn in a green color. More commonly recognized in the Statue of Liberty – due to oxidation. The bronze equestrian statue of Cosimo I by Giambologna, pictured above, reflects the famous equestrian statue of Marc Aurelius located at the Campidoglio in Rome. It illustrates the relation between the Roman Empire and Florence and Cosimo I himself. By far the most moving experience in all of Florence is seeing the original David with your own eyes located inside the Galleria dell’Accademia. Unfortunately, photography is not allowed inside the Galleria and therefore I have attached a picture of the replica of The David located in Palazzo Vecchio. 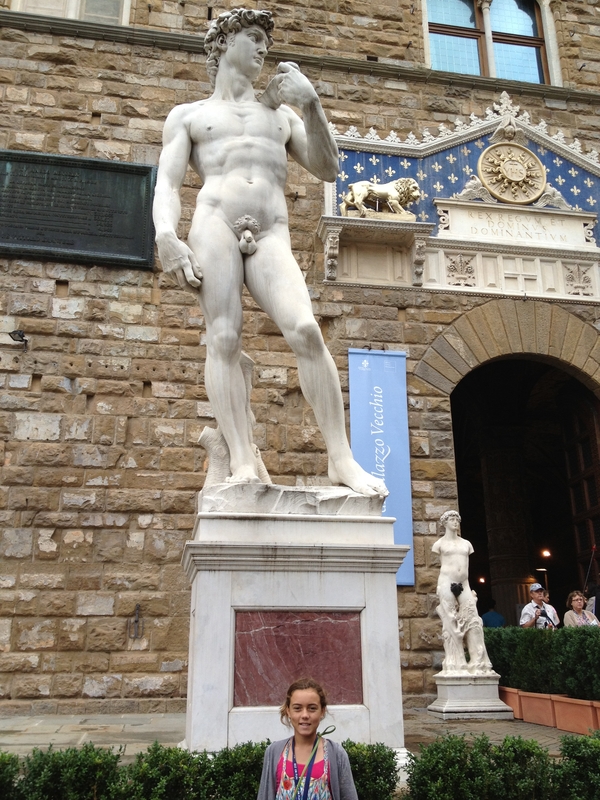 The David is known as the world’s most famous statue. The statue, which is 17 feet tall, was commissioned by the Florentine republic, who saw the biblical hero slaying the giant Goliath as a symbol for the creation of the nascent republic. The statue was installed in front of the Palazzo Vecchio but in 1873 it was replaced by a replica and moved to the Galleria dell’Accademia to protect it from the elements. Another replica can be found at the center of the Piazzale Michelangelo. The statue was created by Michelangelo in 1501-1504 from a single block of marble and instantly became admired for its proportions and attention to detail. Michelangelo chose to depict David as an adolescent instead of a young boy. The statue brought instant fame to the 29 year-old Michelangelo. 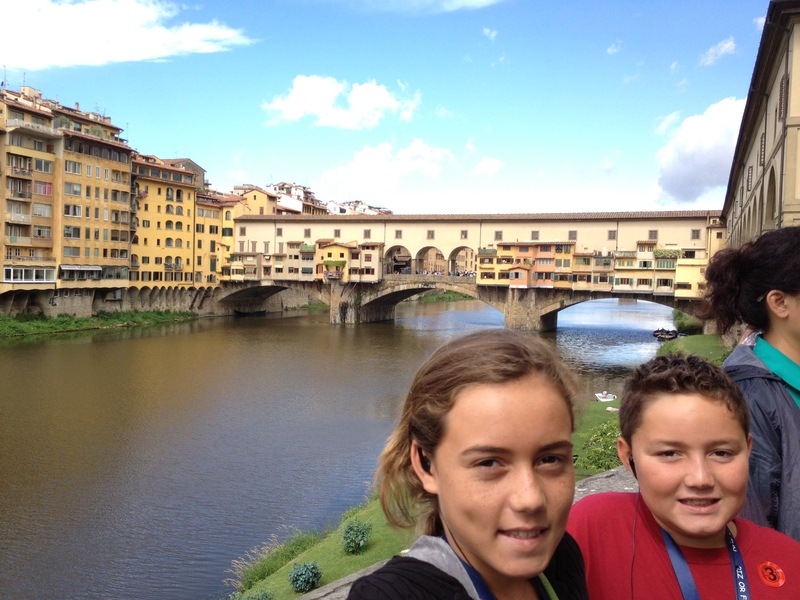 The Ponte Vecchio means “Old Bridge”. It is a Medieval stone closed-spandrel segmental (space between two arches) arch bridge which spans over the Arno River, in Florence. The Ponte Vecchio is unique as it has shops built along it, which used to be common. Butchers originally occupied the shops in the Ponte Vechhio but now they are filled with jewelers, art dealers and souvenir sellers. History of the bridge~ The bridge crosses the Arno at its narrowest point where it is believed that the via Cassia (important Roman road) crossed. When was it built? The bridge first appeared in a document of 996. It was reconstructed in stone, after being destroyed by a flood in 1117. In 1333, the Ponte Vecchio was swept away again but two of its central piers were saved. Giorgio Vasari recorded that the bridge was rebuilt in 1345. that attributed its design to Taddeo Gaddi, besides Giotto one of the few artistic names of the 14th Century still recalled two hundred years later. Modern historians present Neri di Fioravanti as a possible candidate. Displayed in a little gallery at the central opening of the bridge is a weathered dedication stone, which once read Nel trentatrè dopo il mille-trecento, il ponte cadde, per diluvio dell’ acque: poi dieci anni, come al Comun piacque, rifatto fu con questo adornamento, which means “In the thirty-third year following thirteen hundred, the bridge fell, from a watery flood: ten years later, at the pleasure of the Commune, it was rebuilt, with this adornment”. 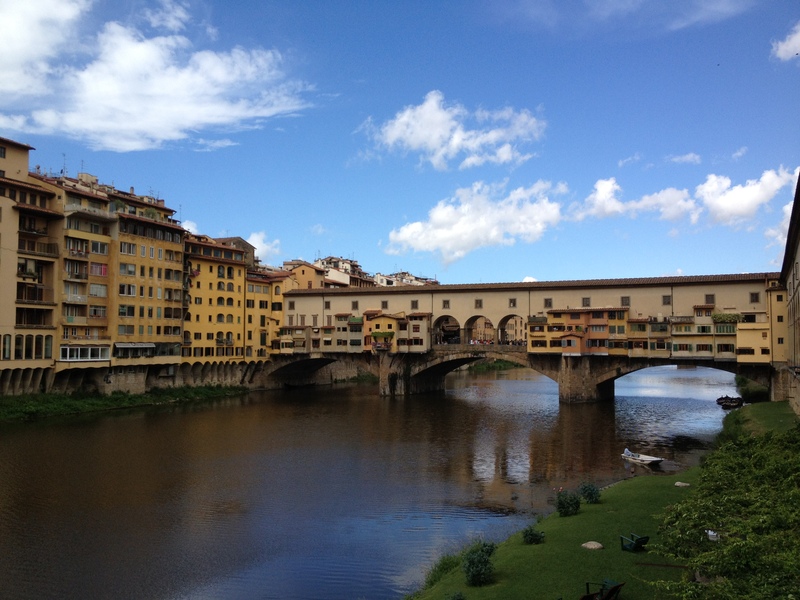 Structure of the Ponte Vecchio~ The bridge consists of three sections of arches. The main arch has a span of 98 ft and the two side arches each span 88 ft. The rise of the arches is between 11½ to 14½ feet. On August 4, 1944, During World War II, the Ponte Vechhio was not destroyed like all other bridges in Florence. The buildings at both ends of the bridge were destroyed which prevented access . The buildings have since been rebuilt using a combination of original and modern design. 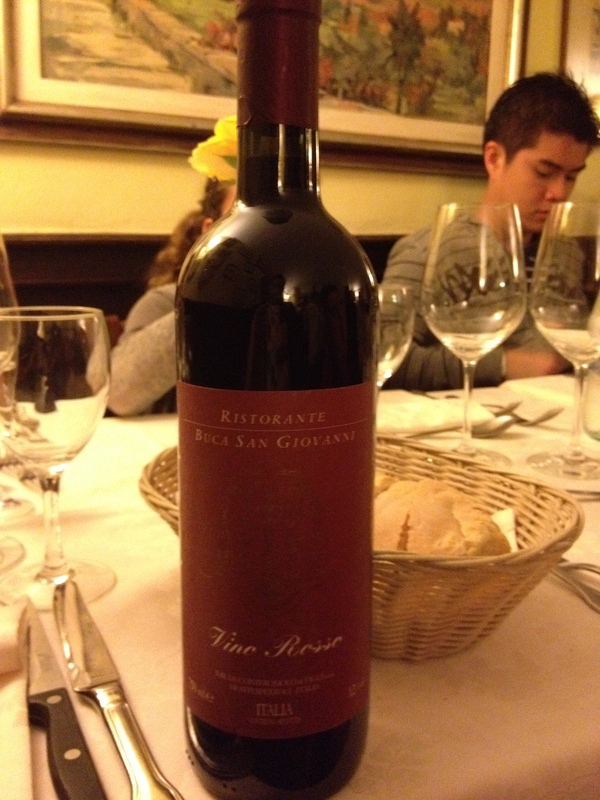 Finding a restaurant or “ristorante” in Florence is no easy task I must warn you. 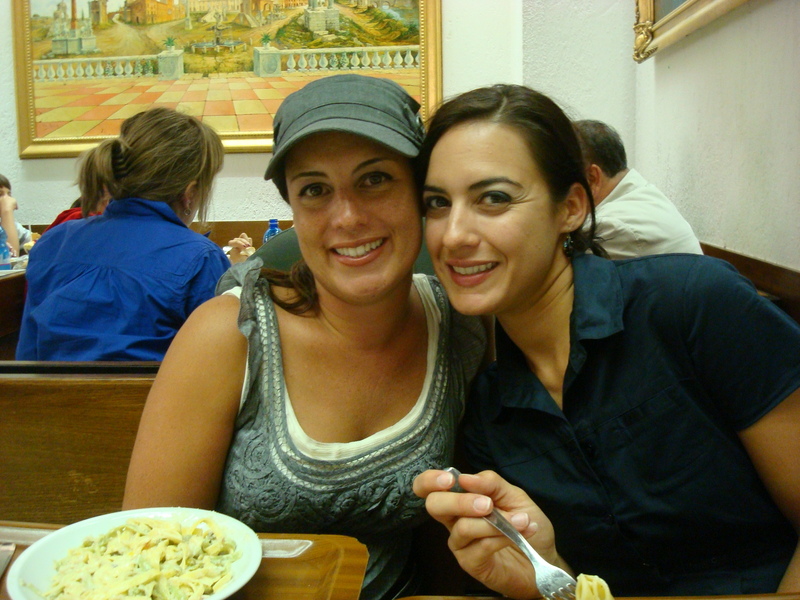 There are 1797 restaurants in Florence!!! Fortunately, we were on tour and the restaurant was already chosen. We really were fortanute because we experienced the BEST baked lasagna we have ever had in our lives. 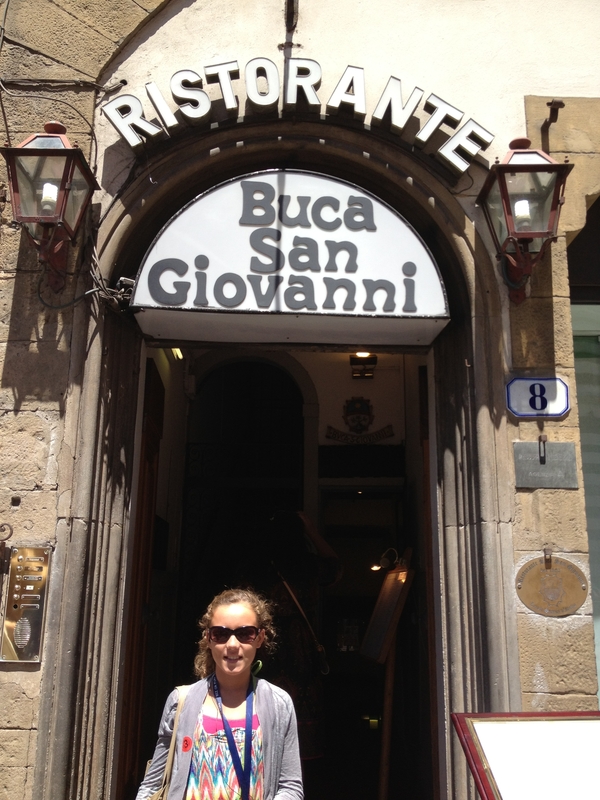 Ristorante Buca San Giovani opened in 1882 and is located in the Piazza Di San Giovanni. They are open for lunch and dinner and ideally located downtown Florence. It is just steps away from the historical city centre and it’s masterpiece like the Cathedral, Palazzo Vecchio, Uffizi Gallery, Loggia dei Lanzi, Ponte Vecchio,The David at the Accademia. The wine list has a selection of 40 red wines!!! This is compared to the list of White/Pink wine which has 10 selections. Can you say heaven?? One of my favorite things about dining in Italy is that you will almost always have three glass at your setting for lunch or dinner for red wine, white wine and water. Can’t we all dine this way universally?? 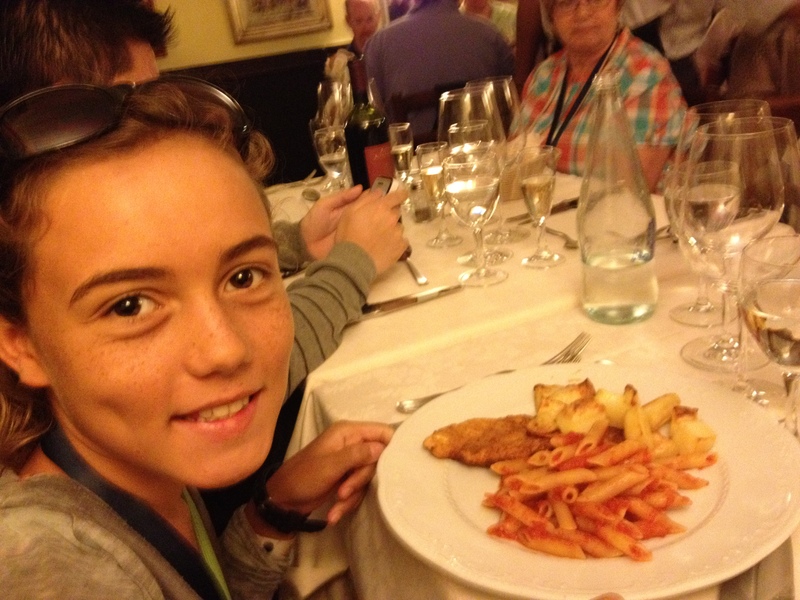 Here’s the real question, does the food, bread and wine taste better just because you are in Italy? Very well could be. Since we were in a group, we had the pleasure of dining downstairs which is actually underground~ in the Gallery. It was amazing!! The gallery has red brick ceilings in an arcg form and feels as if you are eating in a wine cellar with wine bottles everywhere you look. Interesting historical fact~ the Buca San Giovanni was the former Sacristy of the Baptistry San Giovanni, before the building of the Cathedral Santa Reparata, later on was a secret meeting place where the Rosa Croce Masons started the activities. Many important people showed at the “Buca” like the Prince of Bulgaria for his bachelor party in the 30’s and th U.S. President John F. Kennedy. Movies you ask? 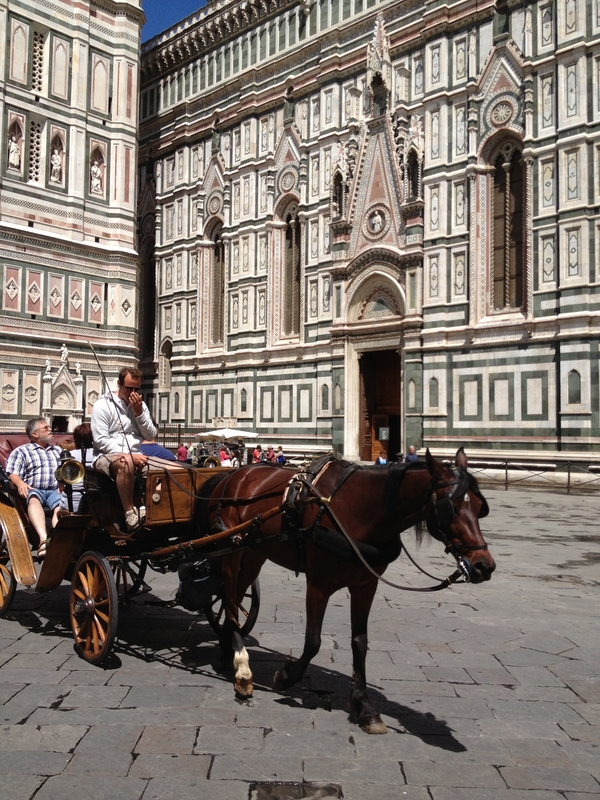 Florence is so picturesque that is has been the setting for many movies. Many of the movies are International of course but some that you may be familiar with are The Dark Knight Rises, A Room With a View, Tea With Mussolini, Stay As You Are, Hannibal, The Devil in Love, The Mandrake, My Friends and Romola. Shopping!!!! 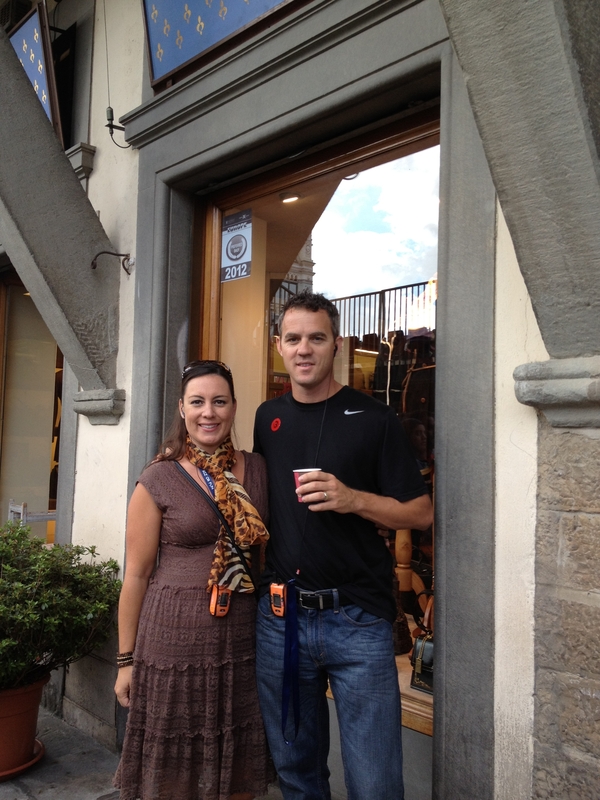 My favorite thing about shopping in Florence is the Italian leather. I was sniffing purses, belts and wallets everywhere we went. Be sure to look for the label stating “genuine leather made in Italy” as there are a lot of vendors selling knock offs and faux leather. Money Saving Tips: Don’t buy any knockoff goods from any of the hawkers selling their fake Prada (or any other high-end designer) on the streets. It’s illegal, and fines are astronomical if the police happen to catch you. The police will fine you a hefty fee while the vendors only receives a small fine. Faux leather is pretty easy to detect. Touch, feel and smell the leather. As crazy as that may seem, I opened all the zippers and looked at the lining. If it has a plastic feel to it at all, don’t buy. The vendors on the street, as opposed to in the shops, often times will offer bargains. I bought two leather purses for €10 less than if I would have purchased them individually. For the Love of Gelato!!! 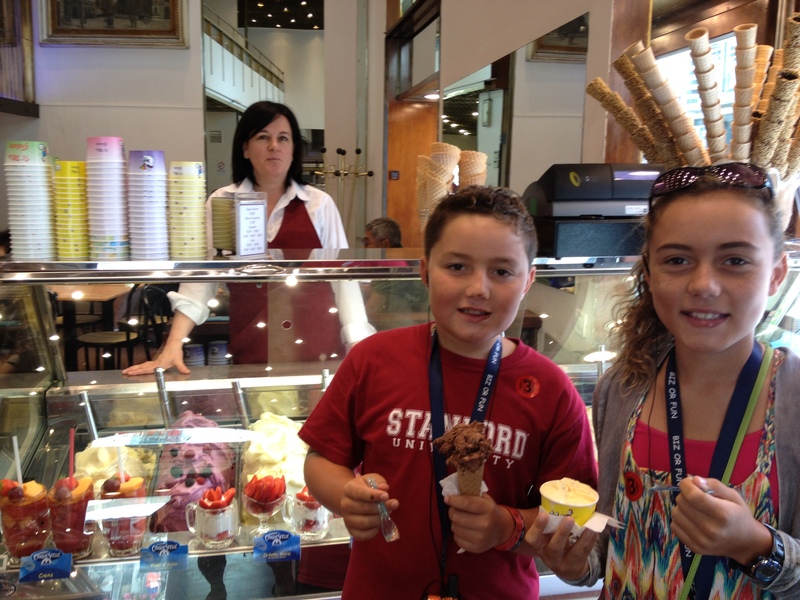 Throughout the Mediterranean our kids flipped out over gelato!! Everywhere we went, they wanted more and more. 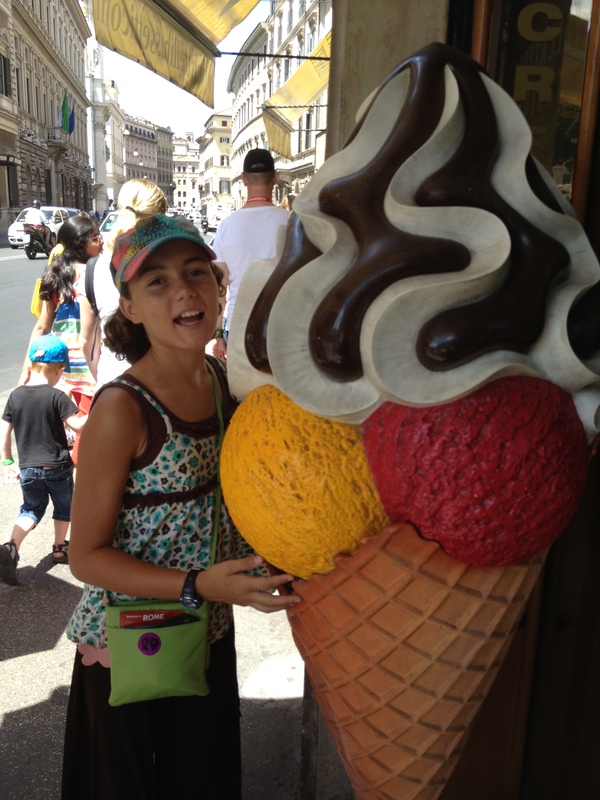 In Florence, Italy our daughter ate gelato three times in one day which is not cheap. Gelato is the Italian word for ice cream, but is it really the same thing as ice cream??? Gelato refers to varieties of ice cream made in a traditional Italian style. Gelato is made with milk, cream, various sugars, and flavoring such as fresh fruit and nut purees. Often times you will see it served in a glass as a parfait or in a dish with whole fruits. 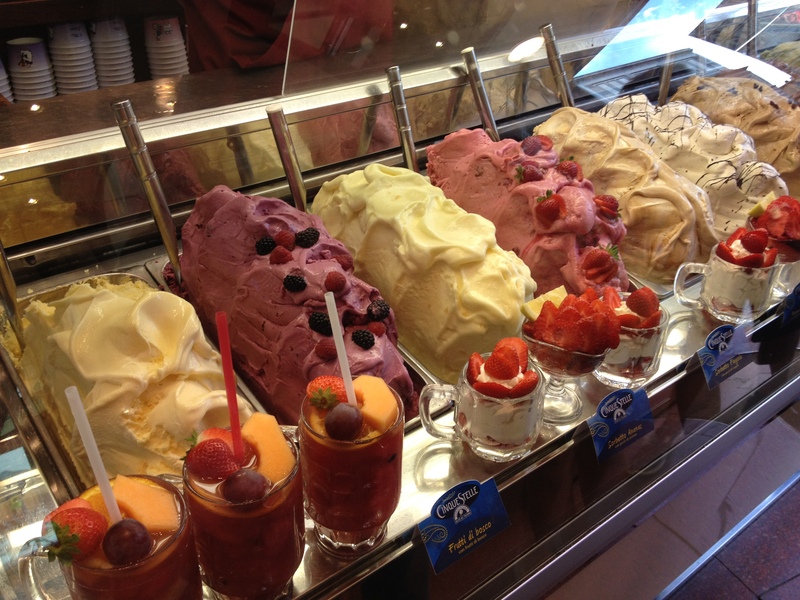 In the picture above the gelato is displayed in parfaits. Whether in a cup, on a cone or in a dish~ It’s all amazing!!! First you must know the gelato lingo!!! Gelati is plural for gelato and Gelateria is where geltao is sold. 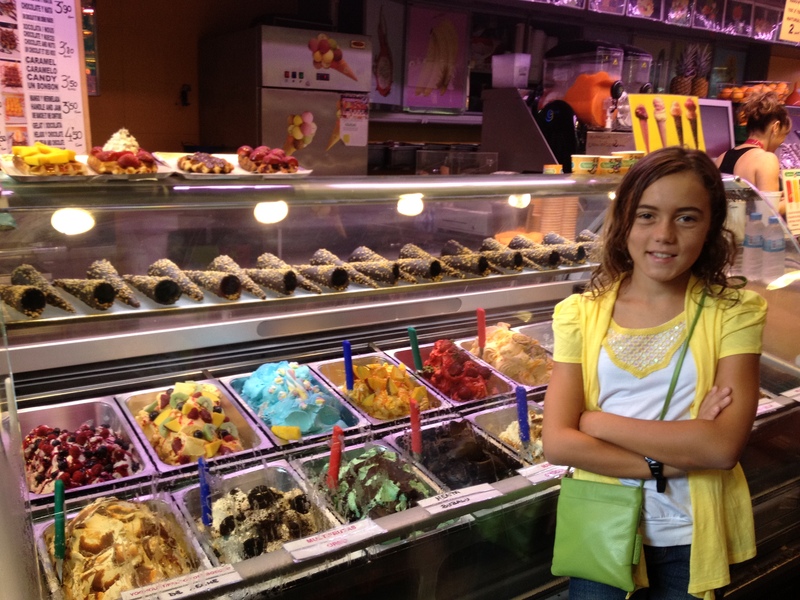 Money saving tips: We ate gelato all along the Mediterranean. Be sure to look around and price out the gelato as some gelaterias are located on the same block for twice as much and the one next door. At Piazza Navona in Rome for example, gelato is priced very high within the piazza but if you step a block outside of the piazza you can find it much cheaper and just as good! It’s the same for paella in Spain or wood burning oven pizzas in Rome. When visiting Barcelona, the Mercat de Sant Josep de la Boqueria (The Market) has amazing gelato for much cheaper than purchasing on La Rambla. If you would like to read more about The Market, click on the link Mercat de Sant Josep de la Boqueria on the right hand side under “topics”. What makes gelato different from ice cream? Gelato is a type of soft ice cream which contains a relatively small amount of air. Gelato in Italy must have at least 3.5% butterfat. The sugar content in homemade gelato, as in ice cream, is balanced with the water content to act as an anti-freeze to prevent it from freezing solid. Several types of sugar are used including sucrose, dextrose, and inverted sugar to control sweetness. Typically, gelato—like any other ice cream—needs a stabilizing base. Egg yolks are used in yellow custard-based gelato flavors, including zabaione (an Italian dessert, or sometimes a beverage, made with egg yolks, sugar, and a sweet wine) and creme caramel, and non-fat milk solids are also added to gelato to stabilize the base. Starches and gums, especially corn starch, are often used to thicken and stabilize the mix. Facts about Gelato~ In the United States there isn’t a standard of definition for gelato set forth by the U.S. Department of Agriculture, as there is for ice cream. Ice cream in the U.S. is defined by the Federal Code both by its ingredients, which includes milk fat of 10% or more, gelato in the U.S. covers a wide range of products including frozen desserts eaten like ice cream; products that are identical to ice cream with the exception of their butterfat contents; and premium ice cream containing butterfat far exceeding the minimums set forth in Italy. Recipes will vary as will the person making it, but most dairy gelato contains 16–24% sugar. Whereas, ice cream in the United States contains 12 to 16% sugar. Where does gelato come from? The history of gelato dates back to frozen desserts in Sicily, ancient Rome and Egypt which were made from snow and ice brought down from mountaintops and preserved below ground. Then, frozen desserts appeared during banquets at the Medici court in Florence. Bernardo Buontalenti, the Florentine cook, is said to have invented modern ice cream in 1565. He presented his recipe and his innovative refrigerating techniques to Catherine de’ Medici, who in turn brought the novelty to France as Queen consort. In 1686 the Sicilian fisherman Francesco Procopio dei Coltelli perfected the first ice cream machine. Gelato increased in popularity in the 1920s–1930s in the northern Italian city of Varese, where the first gelato cart was developed!! Interesting Gelato Stat: Italy is the only country where the market share of handmade gelato versus industrial one is over 55%. 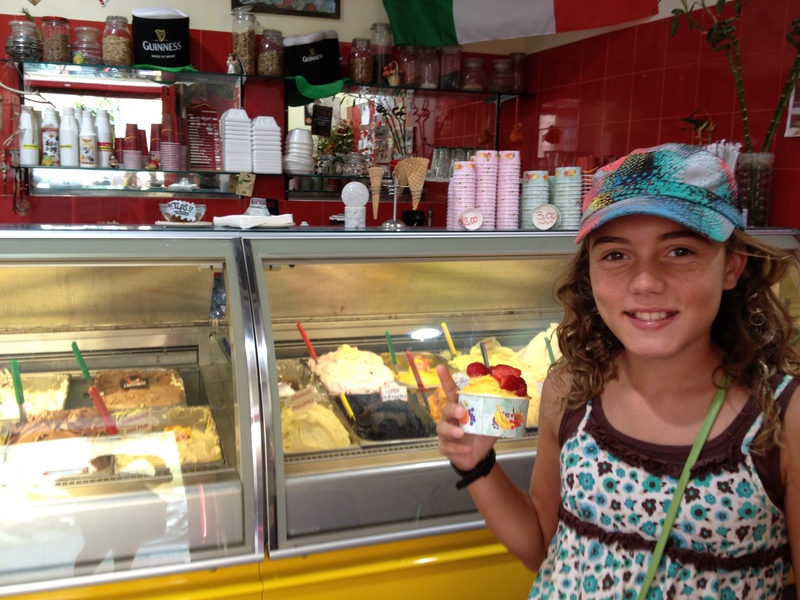 More than 5,000 modern Italian ice cream parlors employ over 15,000 people today, mostly Italians. Want to make your own gelato??? Making gelato is similar to making ice cream. There are several steps involved. The mixture for gelato is typically prepared using a hot process first, dissolving sugars. White base is heated to 185 °F completing a pasteurization program. The hot process to make chocolate gelato is basically the same for ice cream and is traditionally flavored with cocoa powder and cocoa butter. Gelato and some premium ice creams are so dense that they require a slightly higher serving temperature. This is the perfect point in which your scoop is firm but not hard and not so soft that it melts immediately. Gelato recipes usually include more egg yolks, more milk and less cream than ice cream. It actually has less fat than regular ice cream. Gelato’s low overrun (less air) makes for an extremely dense, rich and creamy treat that we all love. Sorbets are all about the fruit, fruit, fruit. With the absence of milk, cream or eggs, they depend only on sugar, lemon juice and fresh fruit for flavor. Elegantly simple and refreshingly tart, sorbets were the rage during Victorian years, when they were served as palate cleansers between rich, heavy courses. A sorbetto, the more intense Italian version, generally has more fruit and less water, resulting in a softer, less icy texture. Sorbet is all about the FRESH fruit. Meanwhile, in a medium bowl whip the egg yolks with the remaining sugar using an electric mixer until the eggs have become thick and pale yellow, about 4 minutes. Pour 1/2 cup of the warm milk and cream mixture into the egg mixture and stir. Add this mixture back into the saucepan. Cook over very low heat, stirring constantly, until the mixture becomes thick enough to coat the back of a wooden spoon, about 7 to 10 minutes. Place a strainer over a medium bowl and pour the warm custard mixture through the strainer. Stir in the vanilla and hazelnut spread until it dissolves. Chill mixture completely before pouring into an ice cream maker and follow manufacturer’s instructions to freeze. To serve, scoop gelato into serving bowls and top with hazelnuts. What type of gelato maker should you buy? Gelato makers can run anywhere from $22.00 – $1200 depending on the brand, size and features. De Longhi GM6000 Gelator Maker with Self-Refrigerating Compressor will cost you about $300! Cuisinart ICE-100 compressor is both an ice cream maker and gelato maker which runs about $251. If you own a KitchenAid mixer, there is an attachment for ice cream which is $85.00. Be sure to research before purchase, check out ratings and read reviews as some of the ice cream makers are for both ice and gelato while others are for frozen yogurt and sorbets. Gelato is made to perfection at a slightly lower temperature than ice cream in Italian Gelaterias; however, it can still be made at home using an ice cream maker. 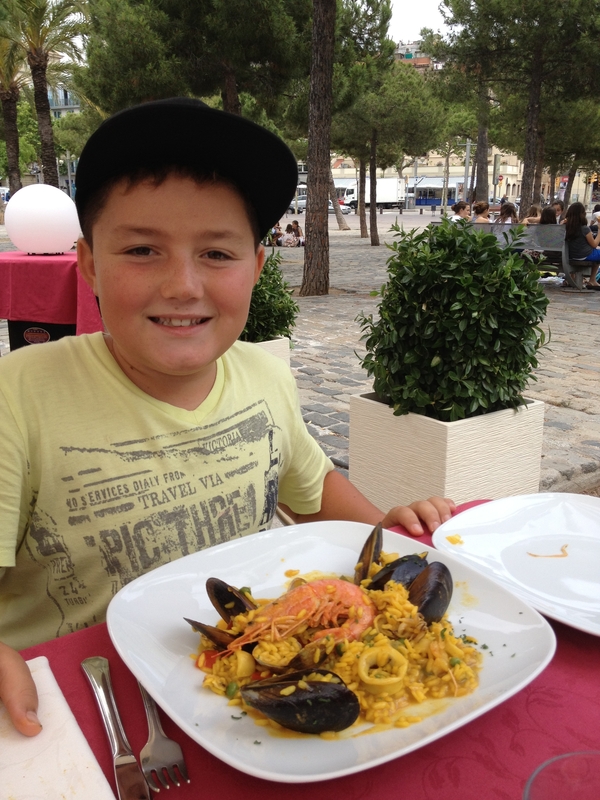 Our son fell in love with Paella while in Barcelona!!!! He loves seafood and rice- so this was a dish come true for him. What exactly is Paella? Paella is a Valencian rice dish which came about in the mid-19th century near lake Albufera, a lagoon in Valencia, on the east coast of Spain. Many non-Spaniards view paella as Spain’s national dish. Most Spaniards consider it to be a regional Valencian dish. Valencians, in turn, regard paella as one of their identifying symbols. So it is a dish shared amongst many regions and many people but commonly served in Spain. This dish is named after the two-handled pan it’s cooked in. The 15-inch paella pan has a wide surface area which ensures that the rice cooks in a thin, even layer.There are three common types of paella: Valencian paella, seafood paella and mixed paella, but there are many others as well. The key to this dish is the crusty caramelized layer of rice, called socarrat, that forms on the bottom of the pan. Valencian paella consists of white rice, green vegetables, meat such as: rabbit, chicken, duck, land snails- beans and seasoning. Seafood paella includes seafood and usually doesn’t have beans and green vegetables. Mixed paella is a free-style combination of land animals, seafood, vegetables, and sometimes beans. 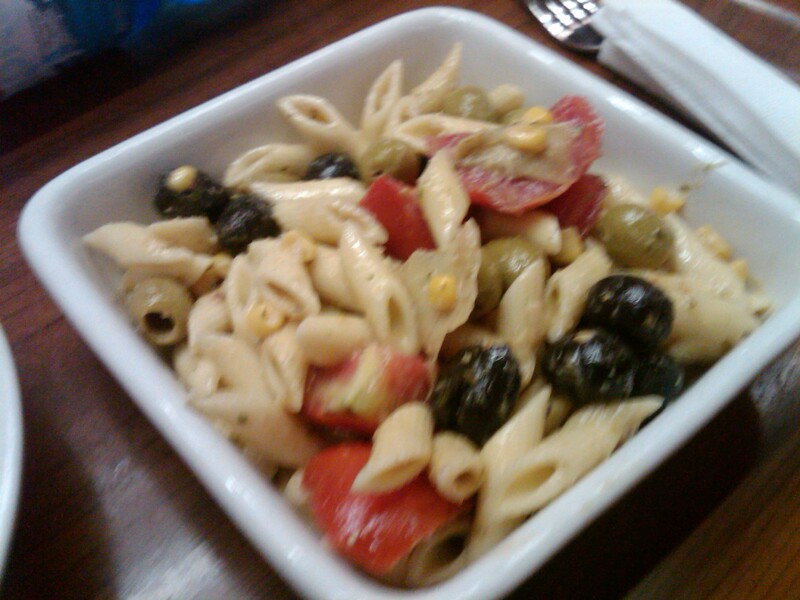 The key ingredients include saffron and olive oil. 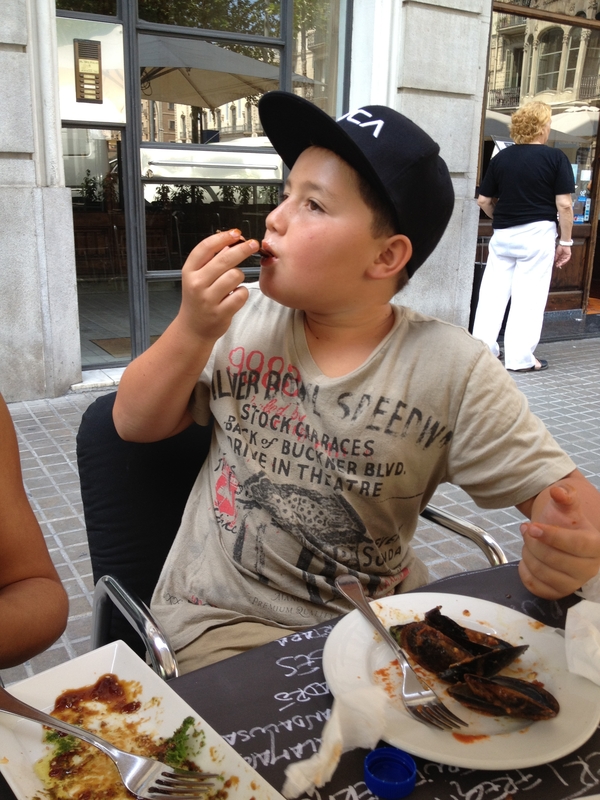 Our son was on a mission to try Paella all over Barcelona. Each version greatly differed. 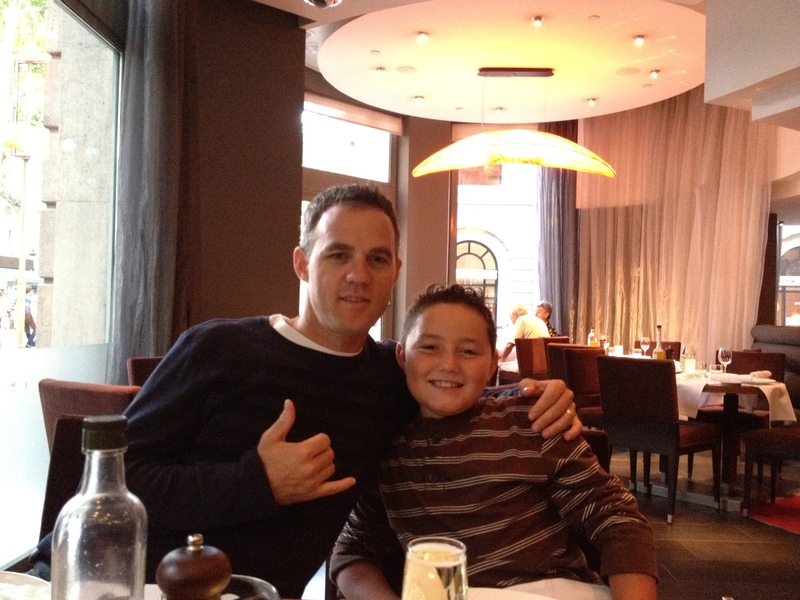 The first place that he ordered Paella was at the Le Meridien Barcelona Hotel on La Rambla. While this is a Jean Georges restaurant which is usually 5 Star and quite pricey, their portions were large and not too expensive considering we sat in the window on La Rambla. We love to sit and watch all of the passerby’s at night. Of course in Spain, dinner doesn’t really start until 9ish and goes until very late!!! The Paella at CentOnze was € 22.50 for a large, adult sized portion. Pretty reasonable for the amount of seafood in the dish including a giant crustacean on the top. We highly recommend this restaurant for price, ambiance and food quality. About Jean Georges Vongerichen: He was born in the Alsace and studied in France. He started his career in le Méridien Singapore and very soon after, he open 10 restaurants in the same area. In 1985, he decided to go to New York and he won 4 stars of The New York Times when he was only 29 years old. He opened restaurants in Boston, Hawaii, Las Vegas, Chicago, London, Paris, Bahamas and Shanghai. Currently he possesses 12 stars in The New York Times thanks to his 4 restaurants in New York (Jojo, Vong, Jean Georges and The Mercer Kitchen). The Fast Food of Paella- GROSS!!! Don’t make the same mistake we did. 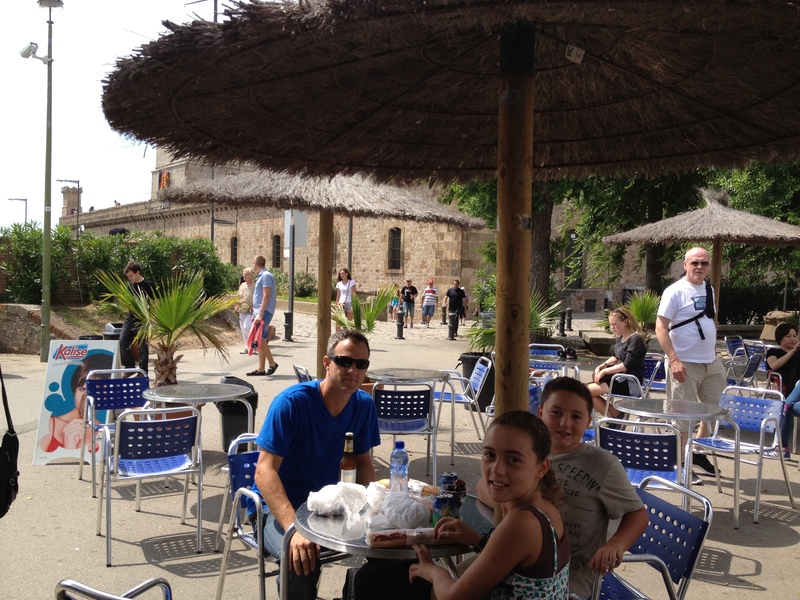 Our son wanted Paella one last time prior to leaving Barcelona, so we went looking for it. 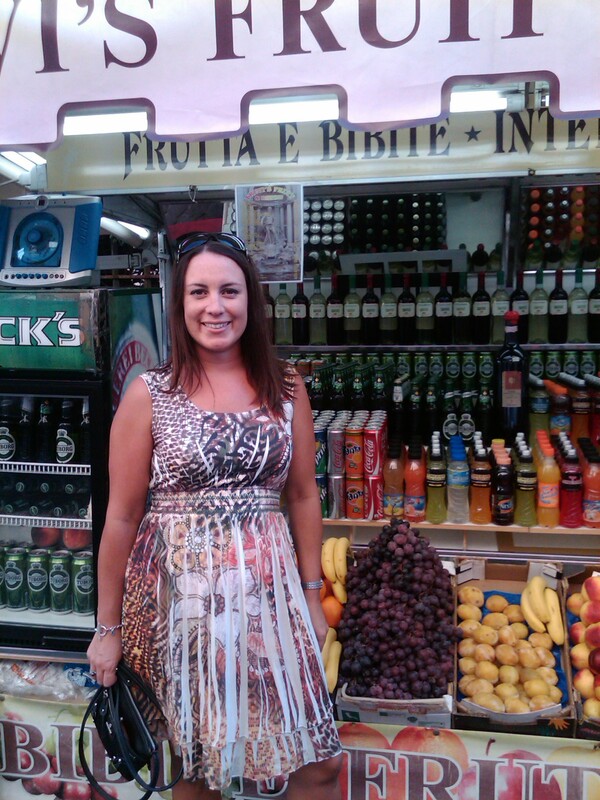 As we walked down a street in Barcelona that the bus dropped us off at, we came across a sign with a picture of Paella. After walking quite a ways and so hungry, we just stopped off at a pizza place which also served Paella. That was probably our sign- pizza and Paella? When it came out, it looked like sticky yellow rice with a bag of frozen peas and a disgusting chicken drumstick. We were actually afraid to let him eat it but he was so hungry. 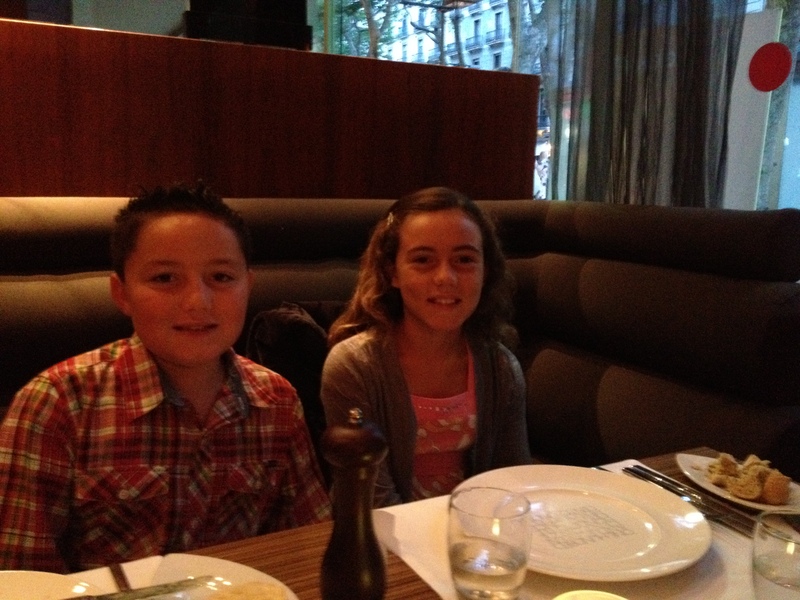 The restaurant was clean, very metro and the rest of us had great food. The Paella was comparable to fast food. Paella in Spain is much like “wood burning stove pizza in Rome” every restaurant swears by it. We paid about € 12.00 for it and it wasn’t worth € 2.00. It actually made us sick looking at it. Most Paella has mussels, shrimp, clams and other seafood such as fish, calamari or crustaceans. As you can see from the picture – this Paella had none of those- just a chicken bone. 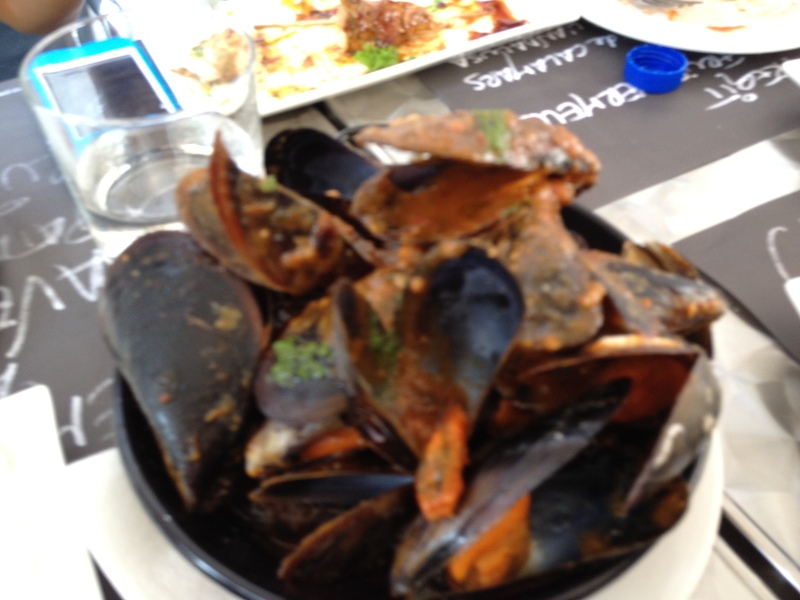 “Mejillones” (mussels) in Barcelona are everywhere!!! 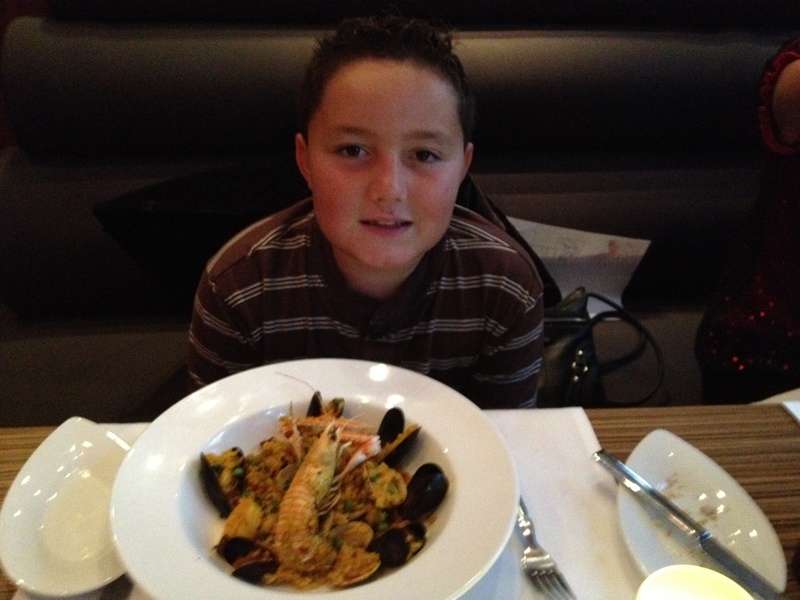 After having his fill of Paella, he moved on to mussels. Spain has tapas everywhere -so we took full advantage of sampling tapas around town. As you can see in the picture of the Tapas sign- mussels were only € 3.30. That’s so cheap!!! 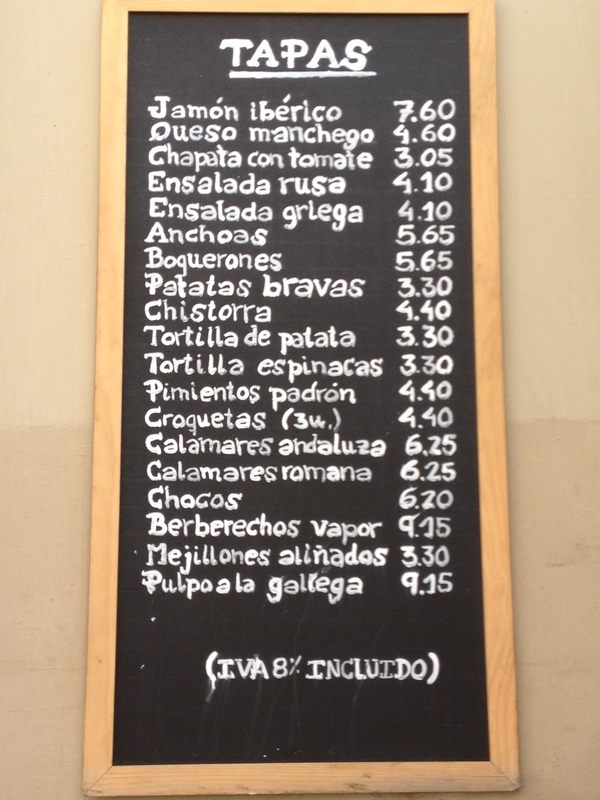 Many of the restaurants in Spain have menus posted on the sidewalk and many of them offer outside seating. In Spain, mussels are consumed mostly steam cooked, boiled in white wine, onion and herbs, and served with the remaining water and some lemon. Mussels are commonly served as “tigres” in Spain, a croquette using the mussel meat, shrimps and other pieces of fish in a thick bechamel then breaded and fried in the clean mussel shell. Mussels are also used in other varieties such as rices or soups or commonly eaten canned in a pickling brine made of oil, vinegar, peppercorns, bay leaves and paprika. Patatas Bravas: also called patatas a la brava or papas bravas, is a dish native to Spain and often served as a tapa in bars. It is made up of white potatoes that have been cut into about 2 centimeter irregular shapes and then fried in oil and served warm with a sauce such as a spicy tomato sauce or a mayonnaise. In the picture you will see that they were served with a white cream dollop which was similiar to a crème fraîche (lighter, less sour than our sour cream in the US). This dish is commonly served in restaurants and bars throughout Spain, where it is traditionally paired with a shot of orujo or a glass of wine. It is one of the most spicy dishes served in Spain. Yummy is all I can say!!! $$ saving tips: Tapas can be extremely pricey!!! The first place that we sat down to for tapas in Barcelona handed us a bill for € 150.00 (times that by .30 for US dollars). What not to do when ordering tapas- if the waiter ask or tells you “I will bring a sampler of tapas” say no! Be sure to look at the menu prior to entering a tapas restaurant. We were drawn in because it looked like a happening place, dishes clanking, lots of people inside, wine glasses and smelled great. We didn’t look at the menu first and accepted the tapas sampler. We had just gotten off of a plane, tired after traveling 22 hours. Won’t make that mistake again. The menu in the picture indicates that there are affordable places which have a vast variety of tapas. Tapas are great because they are small and not really filling so we can restaurant hop along the side walk cafes and try all kinds of food. Tapas are also cheaper during the day! Paella goes well with Sangria!!! Be sure to check out the Sangria page of the blog by choosing the link in the right hand column called “Sangria”. When ordering Paella, look at the quality as well as the price. We happened to find great Paella in a high end restaurant affordably prices and equally as good Paella on the waterfront in Barcelona. 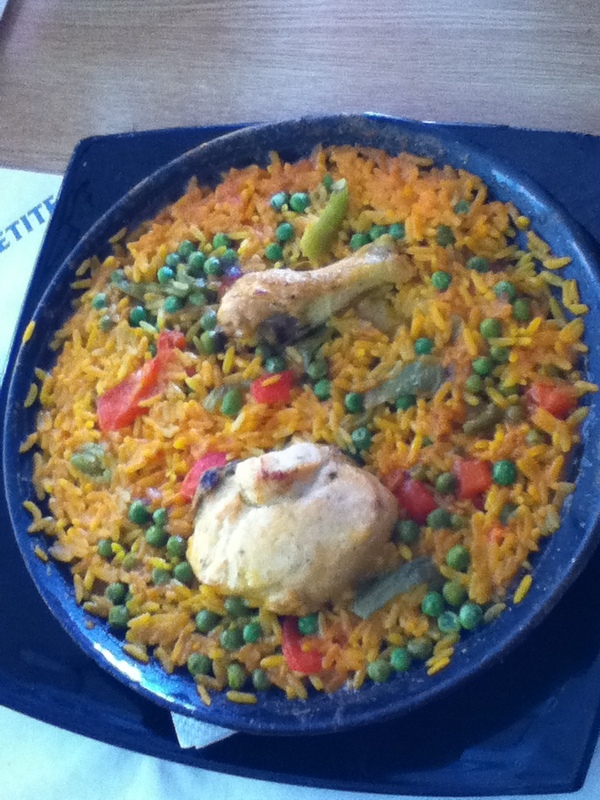 In our experience, if there is a picture of the item on the menu – it is probably more a fast food type of Paella. Try Paella in Spain and then make it yourself at home!! Heat 2 tablespoons olive oil in a large skillet or paella pan over medium heat. Stir in garlic, red pepper flakes, and rice. Cook, stirring, to coat rice with oil, about 3 minutes. Stir in saffron threads, bay leaf, parsley, chicken stock, and lemon zest. Bring to a boil, cover, and reduce heat to medium low. Simmer 20 minutes. advance so we were able to bypass waiting in the long, hot ticket lines. The Vatican is a very high tourist area, as you can imagine and therefore, swarms of people gather around the outside and inside. The ticket lines looked like hundreds of people standing in the blazing sun. 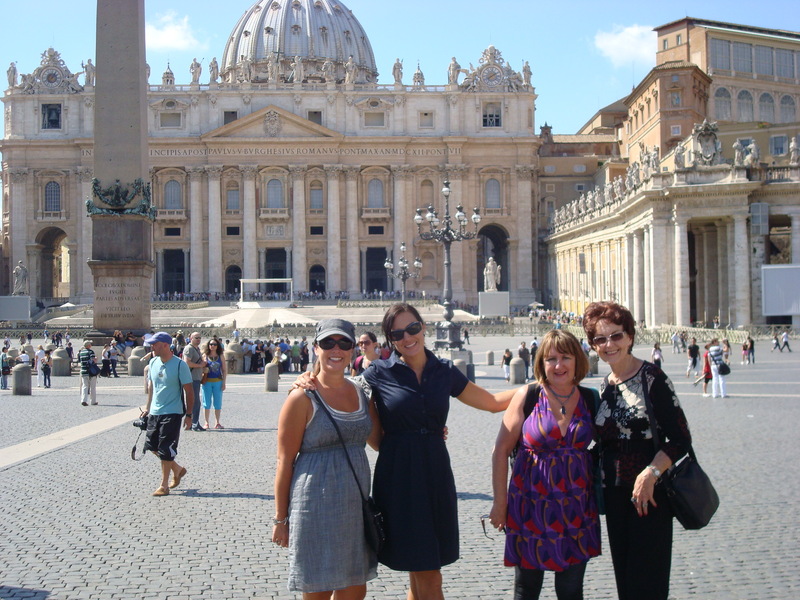 There are several parts to tour within Vatican City, so be sure to research what you want to do and see. There are tours which include several buildings or just one. I did not have the kids with me that day and to be honest, I think it would be too boring for them. The tours are long, crowded and require a lot of standing and walking. Please note, shoulders must be covered upon entering the Basilica. I brought a scarf because it was easy to carry around, provided coverage and was much cooler than a sweater. 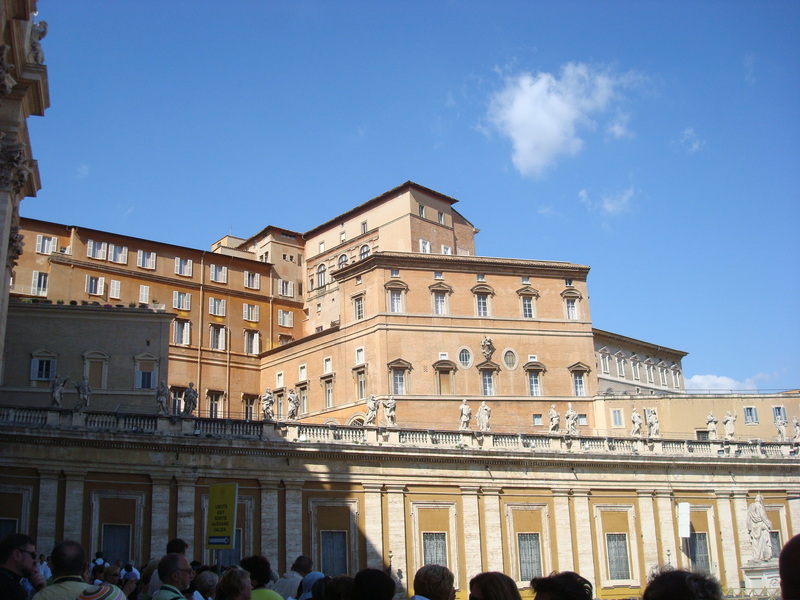 The Papal Apartments have been the official residence of the Pope in his religious capacity since the 17th century. The Papal Apartments in Italian are called appartamento nobile and appartamento pontificio. The apartments have ten large rooms including a lobby, a studio office for the secretary, the pope’s private study, the pope’s bedroom in the corner of the building, a medical suite, a dining room, a small living room, and the kitchen. In addition, the apartments have a roof garden and staff quarters for the nuns who run the household. The pope greets and blesses visitors to Saint Peter’s Square on Sundays from the window of his small study. The top four windows to the right are where the Pope resides. The pope lives there for all months except July to September, when Papal Palace of Castel Gandolfo is the official summer residence.Three of the last five popes, John XXIII, John Paul I, and John Paul II, died in the Papal Apartments. The Vatican is located in Vatican City also known as Vatican City State, in Italian is officially Stato della Città del Vaticano. The Vadicanis a landlocked sovereign city-state whose territory consists of a walled enclave within the city of Rome. 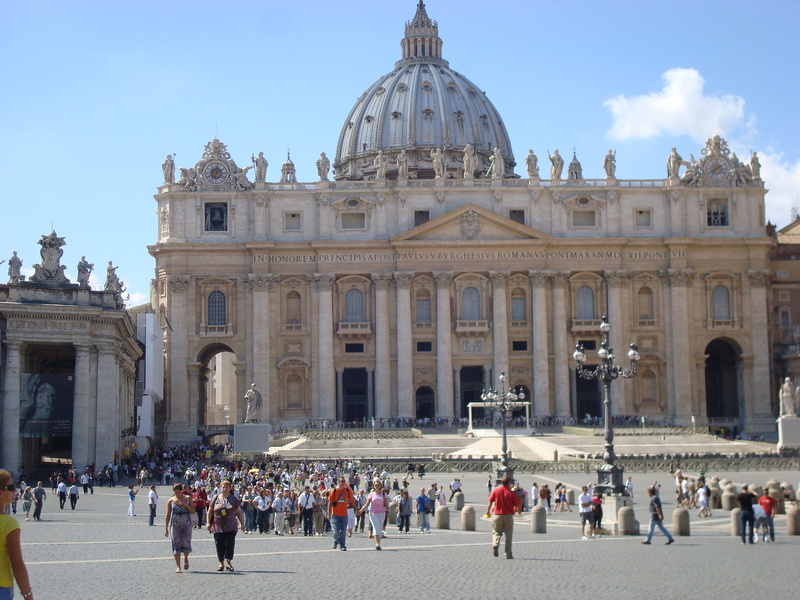 The population in Vatican City is 836 in 109 acres and was founded on February 11, 1929. The basilica is the burial site of its namesake Saint Peter who was one of the twelve apostles of Jesus and the first Bishop of Rome. 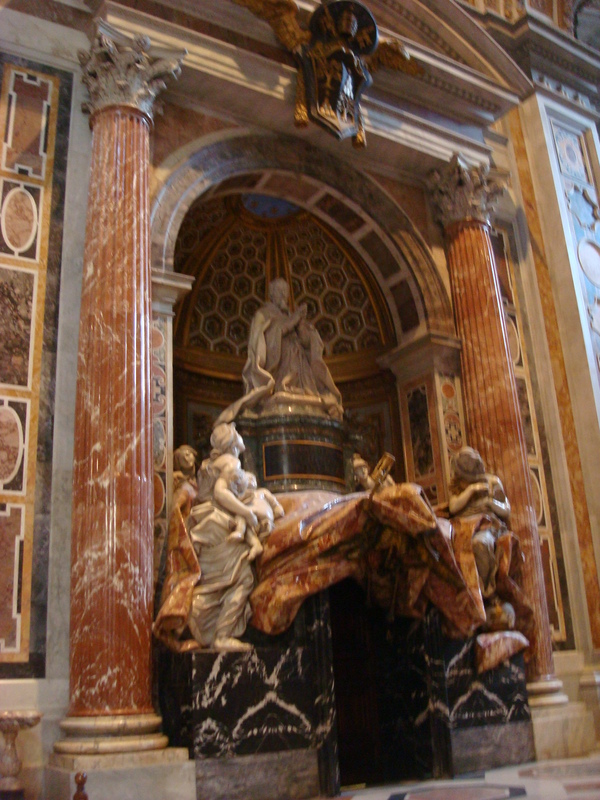 Tradition and some historical evidence hold that Saint Peter’s tomb is directly below the altar of the basilica. For this reason, many Popes have been interred at St. Peter’s since the Early Christian period. There has been a church on this site since the time of Constantine. Construction of the present basilica began on April 18, 1506 and was completed on November 18, 1626. The Pope holds a number of services throughout the year, which audiences of 15,000 to over 80,000 people gather , either within the Vatican Basilica, or in St. Peter’s Square. 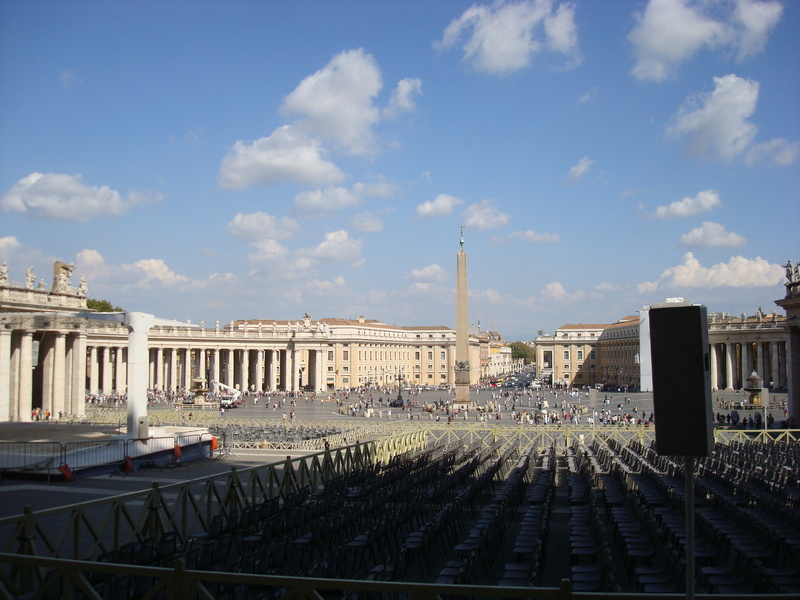 The picture of the Square shows all of the seating present when the Pope speaks. Altar with Bernini’s Baldacchino: Bernini’s first work at St. Peter’s was designing the baldacchino. The baldacchino is a pavilion-like structure 98 ft tall and said to be the largest piece of bronze in the world. The baldacchino is located underneath the dome and above the altar. 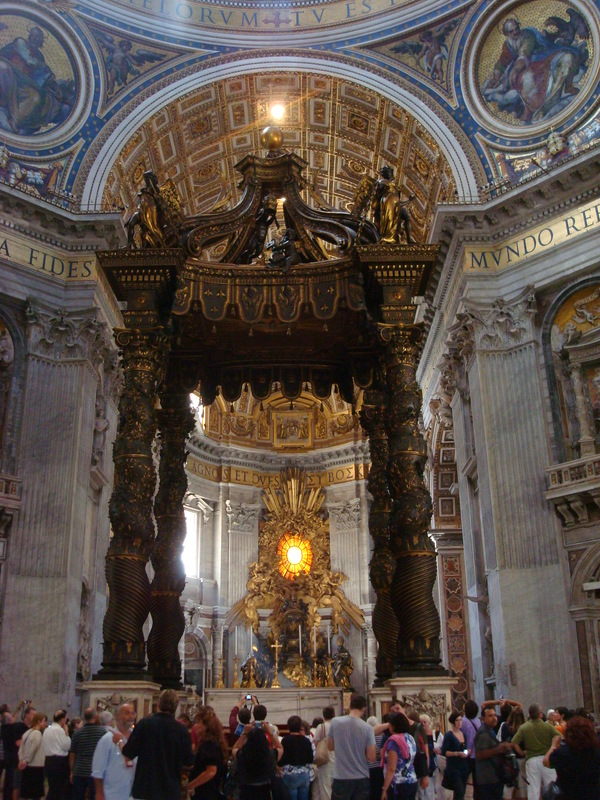 Bernini’s idea for the baldacchino was for something other than the typical white marble and colored stone. Bernini designed four enormouscolumns of bronze, twisted and decorated with olive leaves and beesto represent Pope Urban. The dome of St. Peter’s 448.1 ft high from the floor of the basilica to the top of the cross. This is the tallest dome in the world. When designing the dome, the architects of St. Peter’s looked to the domes of the Pantheon and Florence duomo. St. Peter’s is the greatest dome of Christendom. Next I took a picture of the Tomb of Pope Alexander VII. The color of the marble in person is indescribable. It is so vibrant with gold, orange and amber tones. 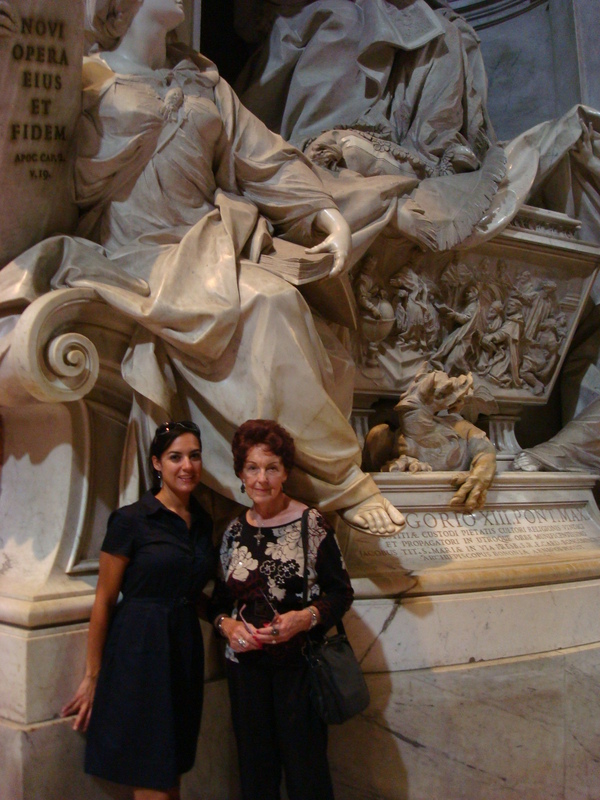 At the age of 80, the Italian artist Gianlorenzo Bernini designed the sculpture Tomb of Pope Alexander VII. It is located in the south section of St Peter’s Basilica in the Vatican City. The piece was commissioned by Pope Alexander himself. Construction of the monument didn’t start until 1671 and then was finally completed eleven years after the Pope’s death in 1678. Just as you leave the Chapel, you will pass the Monument to Gregory XIII on the right. It was built by Camillo Rusconi in 1723 out of white marble. The moument was influenced by Algardi in its structural linearity and the expressive peacefulness. The monument is known as the Figure of Knowledge and represents the pope giving his blessing. Let’s talk food!!! 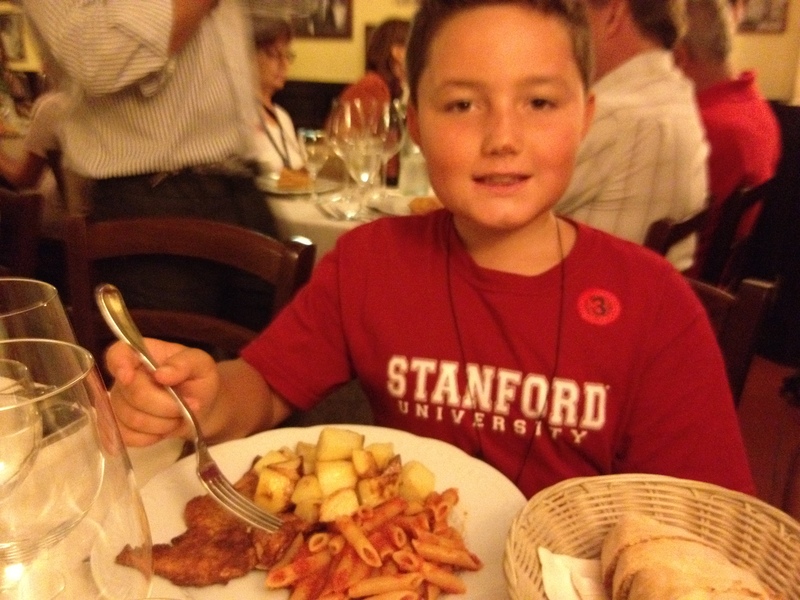 After a long tour of the Vatican, everyone is hungry. As we departed the Square, there was a cafeteria-style restuarant to the left with some of the best Italian food we experienced in Rome!!! We were starving and just started walking and saw tons of people gathering outside in line, sitting in the outdoor seating and it was so noisy. You could hear espresso machines going and dishes clanking around. I think we grabbed one of everything and all shared. 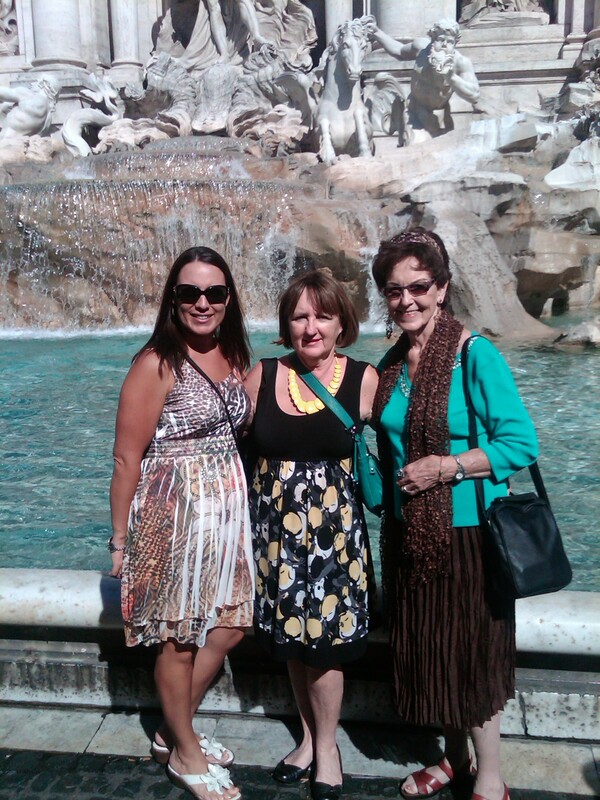 You must see The Trevi Fountain, Fontana di Trevi, in person!! Pitcures of the fountain do not capture size nor the details in the marble and travertine. The fountain is 85.28 feet high and 160.72 feet wide, spilling over 2 million cubic feet of water each day. 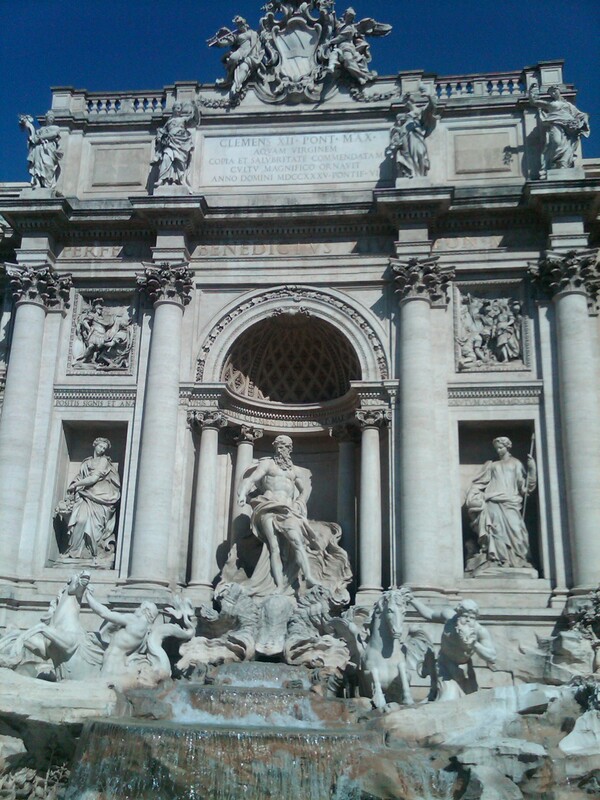 The fountain is a display of ancient roman acqueduct termination and constructed of carrara marble and travertine. In the center of the fountain you will see a statue of Ocean which was carved by Pietro Bracci standing under the trymphal arch. When viewing the fountain, you will see a statue of Abundance to the left and on the right side, a statue of Health. then you will be ensured a return to Rome! Must be true as I threw the coin in the fountain in September 2011 and I ended up back in Rome less than a year later in June 2012. There is a famous song called ‘Three Coins in the Fountain’. $$ saving tips: It is free of charge to view the fountain. There are an abundance of cute boutiques and restaurants tucked in alleyways all around the fountain. Most of the bistros advertise their original pizza by having waiters stand out on the street waving you in. As we stopped off in wood shop to purchase a Pinocchio ornament, the manager said to be very careful of where we ate as many of the restaurants serve pizza made from frozen dough and charge a lot of money due to the location near the fountain. He gave us the tip to look in the restaurant for a wood burning oven and ask to see it if they say they have one. His advice was great! That way we knew where to order authentic Italian pizza made in a wood burning oven. Antoni Gaudí’s gothic style structures. They are very unique by design and interesting to tour inside. We were able to view a few of them during our one week stay in Barcelona. Sangrada Familia is probably the most recognized and visited structure by Gaudí and for this reason, I have created a separate post specifically about Sangrada Familia. So be sure to check out that page by clicking on the word “Sangrada Familia” on the right hand side of the page under “topics”. ‘Modernisme’ movement took place towards the end of the 19th century in Catalonia that extended from ca. 1880 to the First World War. This movement was similiar to other currents such as Naturalism, Arts and Crafts, and Art Nouveau. It was motivated by a return to traditions as an expression of national identity, as well as by the introduction of modern techniques and materials as part of progress. This Modernisme movement was very different from anything else as it pertained to cultural identity. The movement expressed literature and music, painting, sculpture, decorative arts and, of course, architecture. straucture to tour and so we decided to take the kids and see for ourselves!! The best times to tour the bulding are before 10 a.m. or after 4 p.m., otherwise be prepared for crowds. Upon entereing the building you will walk through a downstairs area which has gorgeous glass window formations and indoor courtyards. Go up the elevator and walk around the roof top viewing the clay colored, head formations. The bulding displays what high end apartment life was like 100 years ago. 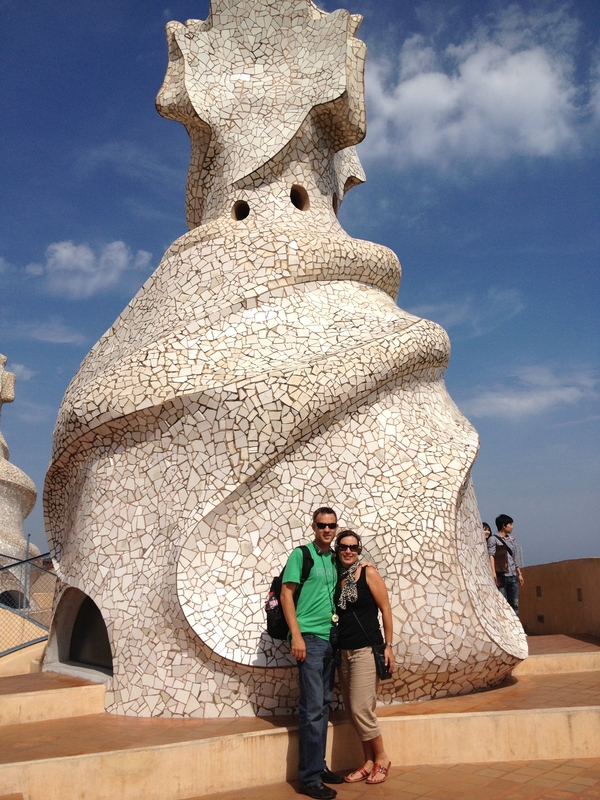 Casa Milà is unlike any building I have ever toured or seen for that matter. I was a little nervous walking around the roof tops as it is very high and you walk up and down hilly, narrow pathways. Upon exiting the building there is a book store with unqiue gifts and souveniers. Casa Milà is also known as ‘La Pedrera’. 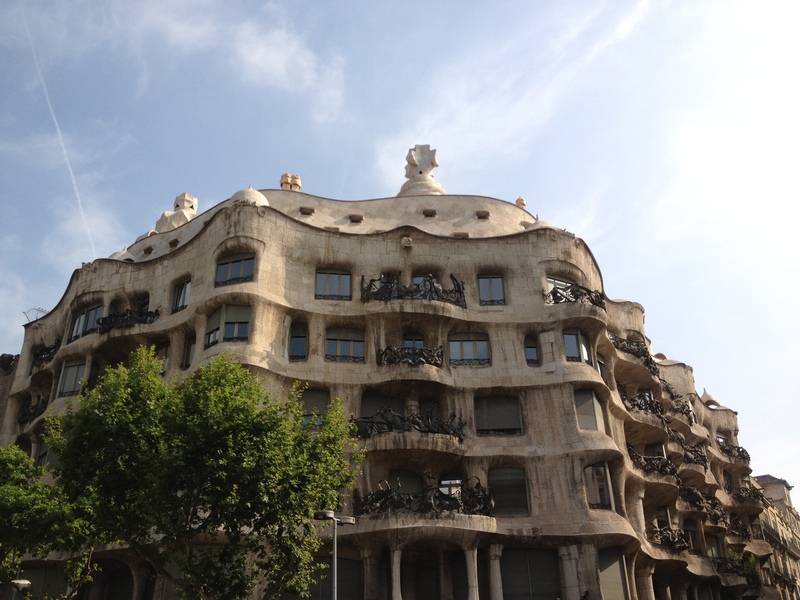 It is a very unusual looking building, which was built between 1906 and 1912 by Gaudí (1852–1926). La Pedrera is the headquarters of Fundació Catalunya-La Pedrera and includes a cultural centre. This bulding is known for an array of activities which are organized, exhibitions and other events. Another one of Gaudí’s masterpieces is the Casa Batlló which opened in 1877 and is located in the heart of Barcelona. Casa Batlló is a remodel of a previously built house. When riding the Barcelona Bus Turístic around you will see Casa Batlló which is located in the very heart of Passeig de Gràcia. Gaudí’ wanted this building to have marine inspiration, such as a dream world, which portrays nature with its earthy elements and bits of fantasy. The house was originally the residence of the Batlló family. 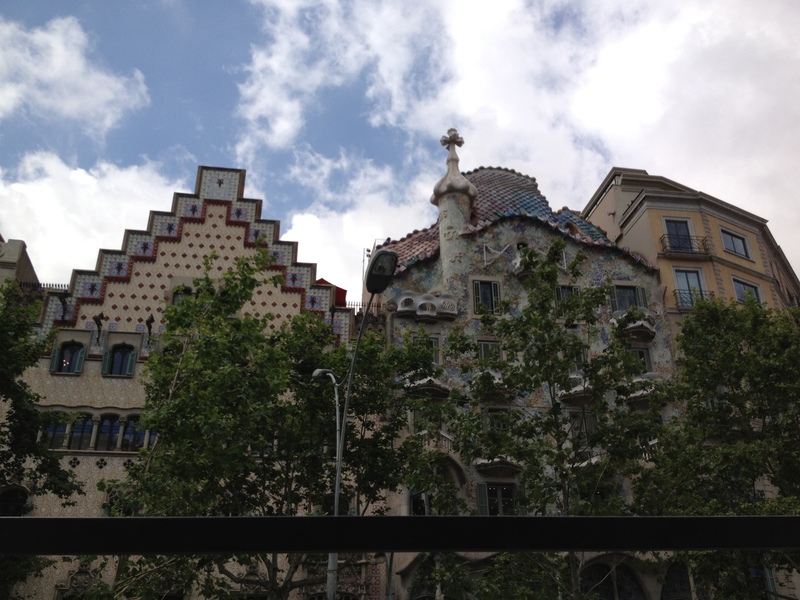 Then, Gaudí included a huge gallery which projects several meters out over Passeig de Gràcia for all to see! He also added large oval-shaped feature windows and inserted stone columns in the shape of bones, and balconies in the shape of masks or gothic figures. On the top of the building there is a spectacular roof which resembles a dragon’s back. In addition, there is a tower with a cross rising up with four arms pointing north, south, east and west. 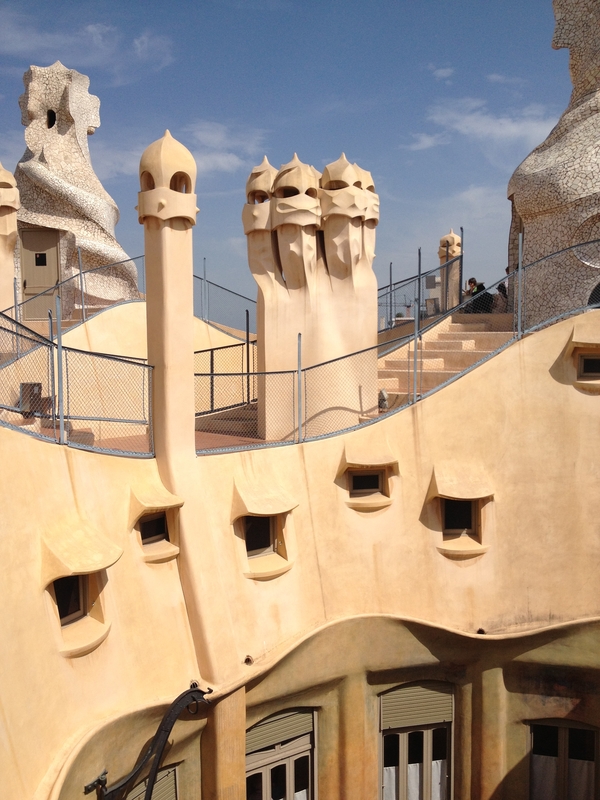 Gaudí is known for his representations such as an animal’s spine on the roof terrace using tiles of different colors on one side and the use of trencadís mosaic technique on the other. The roof also displays four chimney stacks. Gaudí completed a full refurbishment of the building using innovative techniques and creativity. Barcelona City Council selected the house as a candidate for the 1906 award for the best building. 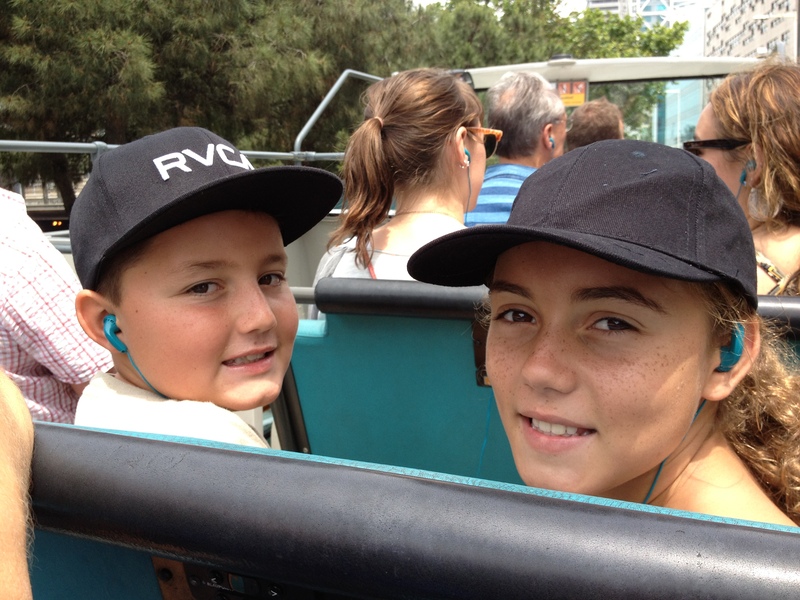 $$ saving tips: Most of the Gaudí structures can be viewed from the Barcelona Bus Turístic. It gets expensive purchasing tickets for an entire family at each building. Some structures you really have to view from the inside, such as Sangrada Familia. However, other structures are shown very close up from the bus. The bus also provides information about the buildings and drives slow enough to take pictures. We were lucky as the bus came to a complete stop often times in front of the buildings due to traffic. Be sure to ride on the top deck to get the best view. The Sangrada Familia must be toured inside to see the various colors of gorgeous marble columns throughout. 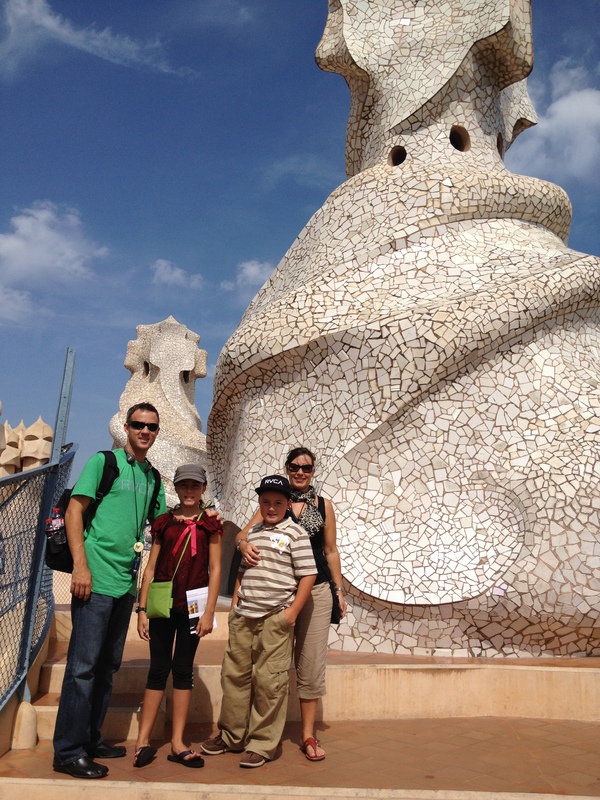 There are so many museums and building to see in Barcelona in addition to all of the Gaudí structures. The best way to save money is to ride the bus around first, take pictures of everything, and map out what you want to return to. 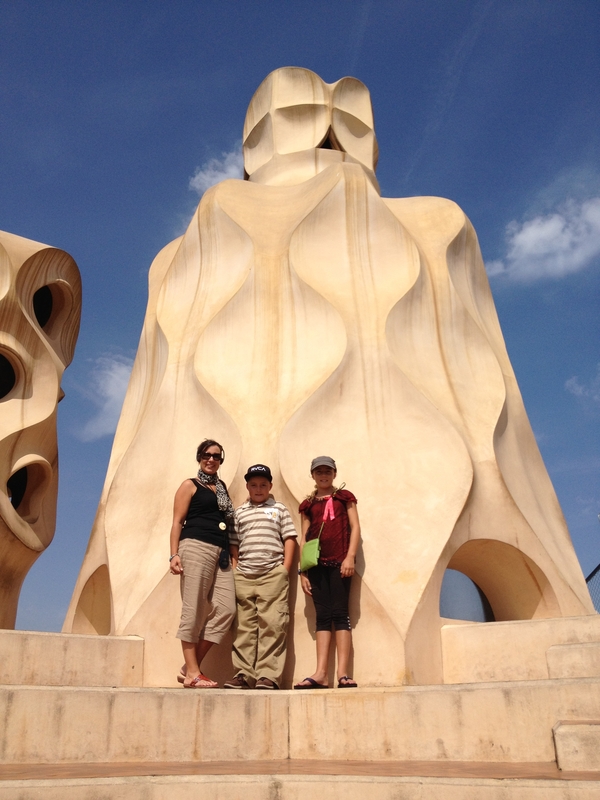 Casa Milà was worth paying for the tour. You don’t need to pay for the guided tour with the head set. We did and then ended up just reading our way through and taking off the annoying head phones. When researching Barcelona I saw Castle Montjuic pop up but it was relatively difficult to find information on in English. I read a review from a mom who said it was one of the things that her kids enjoyed most and that it was free! So I decided to find out as much information as I could, but it was bits and pieces here and there. I am hoping that this post will capture everything I was looking for about the castle in one place! 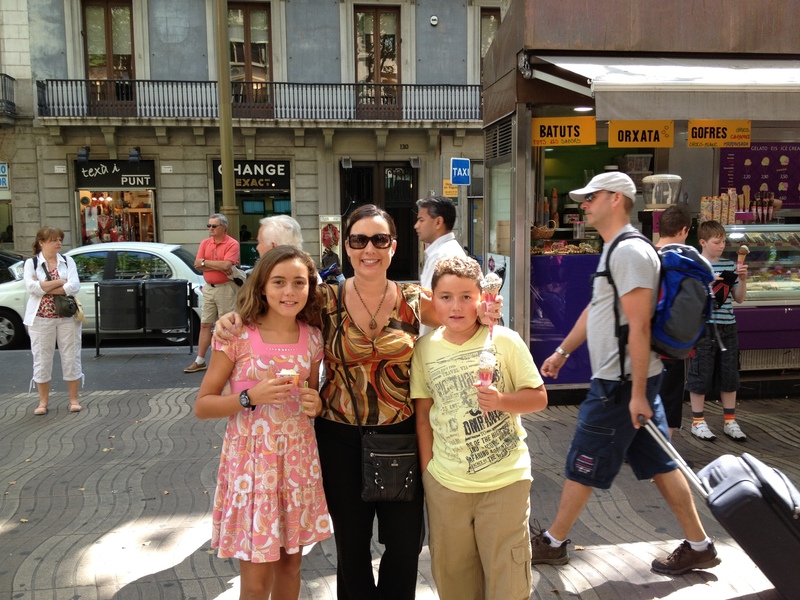 This was a favorite spot in Barcelona for our family because there were so many different things to do in one place and everything is outside. The castle sits up high with gorgeous views of their gardens and the Mediterranean Sea. staying or if you are in Barcelona for a day, you can access the castle location from the double decker bus, Barcelona Bus Turistic. The bus has three routes: red, green and blue. There is a ticket which allows you to ride on all three routes or purchase a single route ticket. For more information on routes and ticket prices please visit the site http://www.barcelonabusturistic.cat/web/guest/informacio. When purchasing a ticket for the bus, it comes with earphones to listen to the tour in 10 different languages if you choose. Castle Montjuic is located on the red route, but prior to reaching the castle, you must take a ride on the cable car, Telefèric de Montjuïc, which transports passengers to the top of Montjuic. The cable car holds up to 8 passengers. 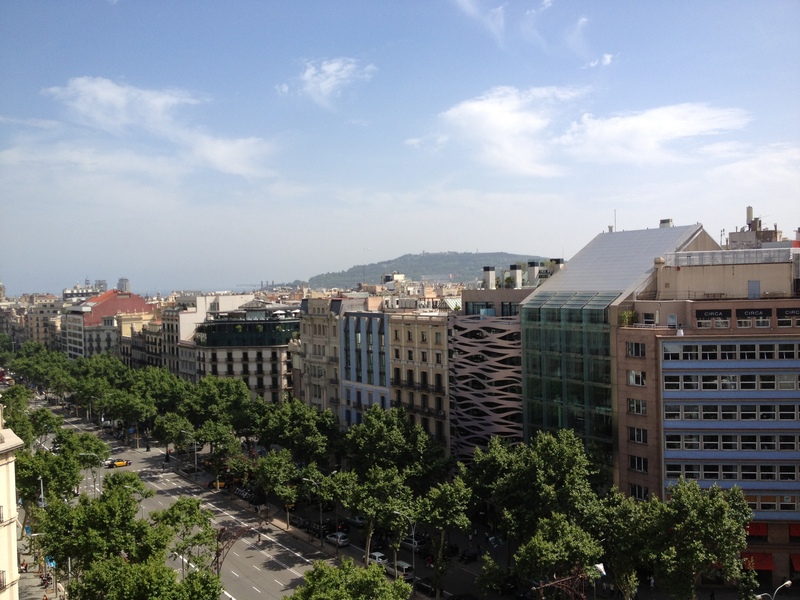 There are fantastic views of Sangrada Familia and Torre Agbar. 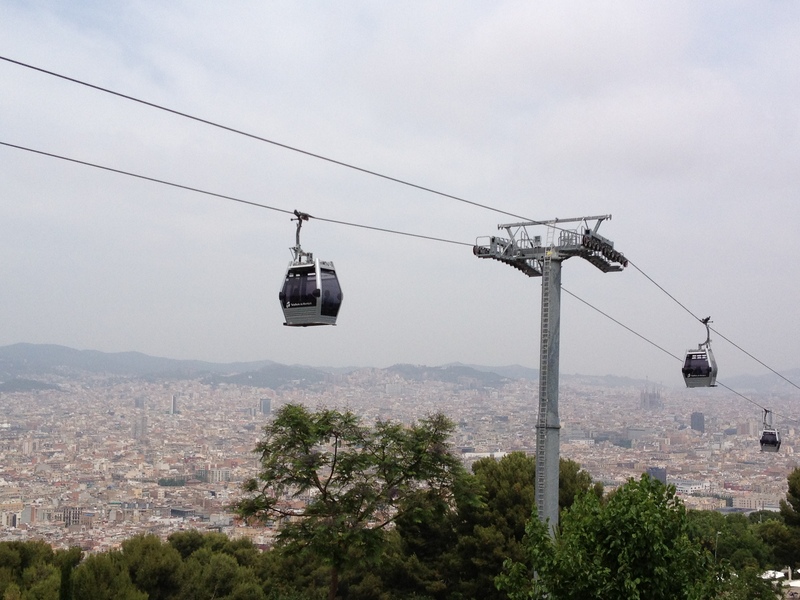 The Telefèric de Montjuïc hours of operation vary seasonally. 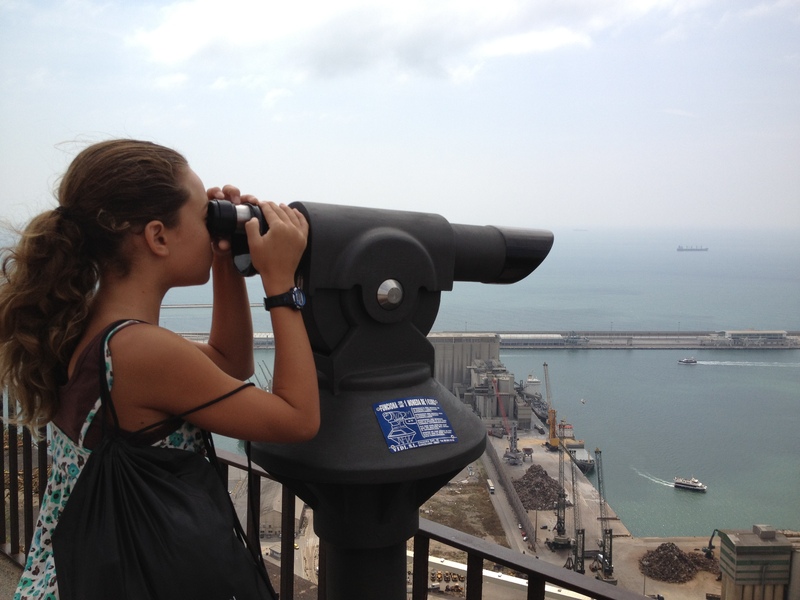 Be sure to double check prior to planning your day at the castle at http://www.tmb.cat/en/teleferic-de-montjuic. There is a lot of walking which involves going up stairs to get to the castle from the cable car. It is best to allow yourself a couple of hours to really explore. There are informational plaques throughout to read about the history, people, construction, etc. In addition, you can eat lunch there. We stopped off at La Boqueria (marketplace) on the way to the bus, purchased salami, cheese and Panini to bring to the castle for a picnic. They sell beverages, have tables and an open lawn to enjoy a nice lunch. Stop off and take a peek through the numerous coin-operated telescopes at various points around the gardens. You will see great views of the beach, the Mediterranean sea and imagine what it was like to be on the look out for approaching ships. Be sure to bring coins! 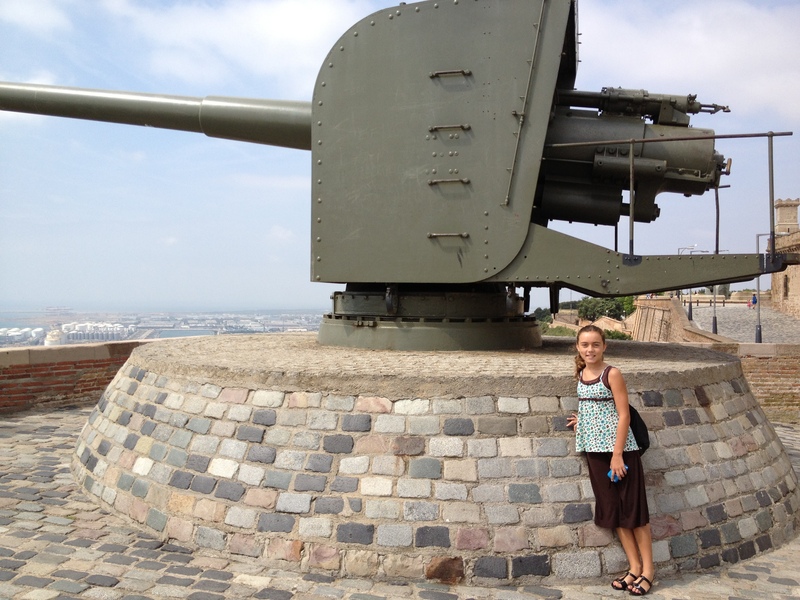 History: Montjuïc Castle is a grand castle that controlled the city since 1640. 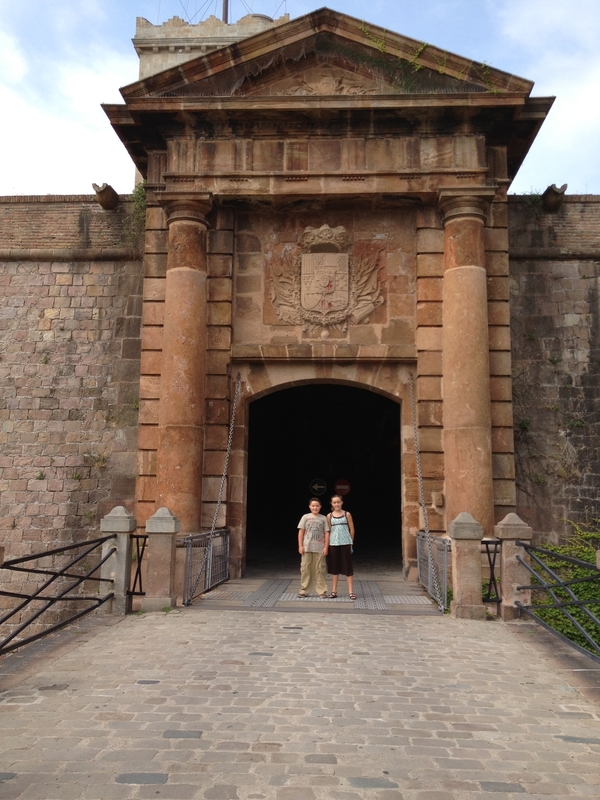 The purpose of the castle was to repress the people during two centuries. Repression of the anarchists in the XIX century and prison for the political prisoners under Franco. 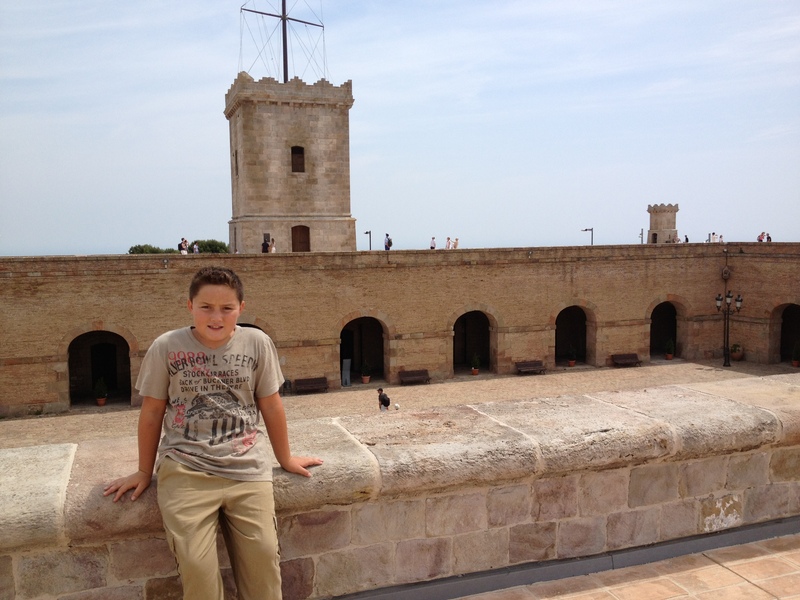 The castle is famous for the execution of in 1940 Lluis Companys, the president of the Generalitat of Catalonia. Nowadays is the only place of the city where you can see a statue of Franco. In addition, the castle shelters a military museum. The castle has a few, little shops to browse through while walking around. 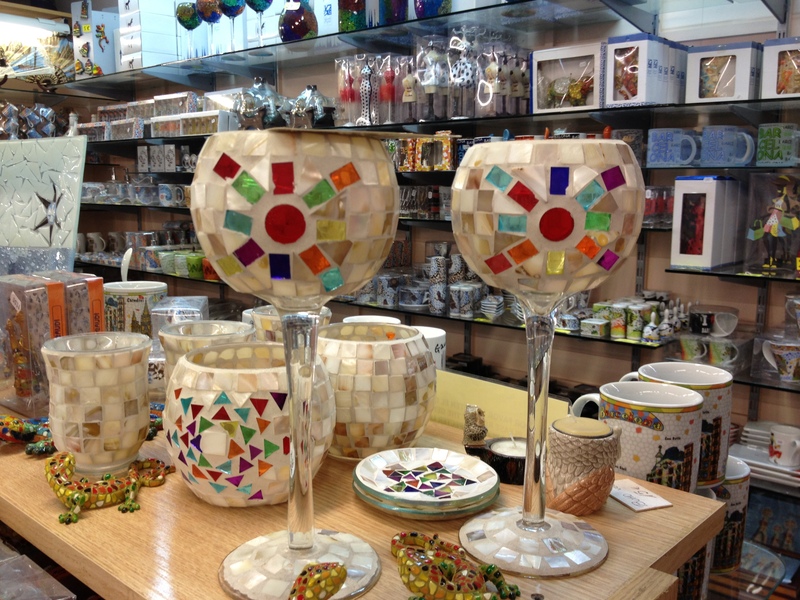 I found a pair of mosaic goblets that I fell in love with and would have purchased without a second thought, but they looked as if they would not ship to Hawaii well. 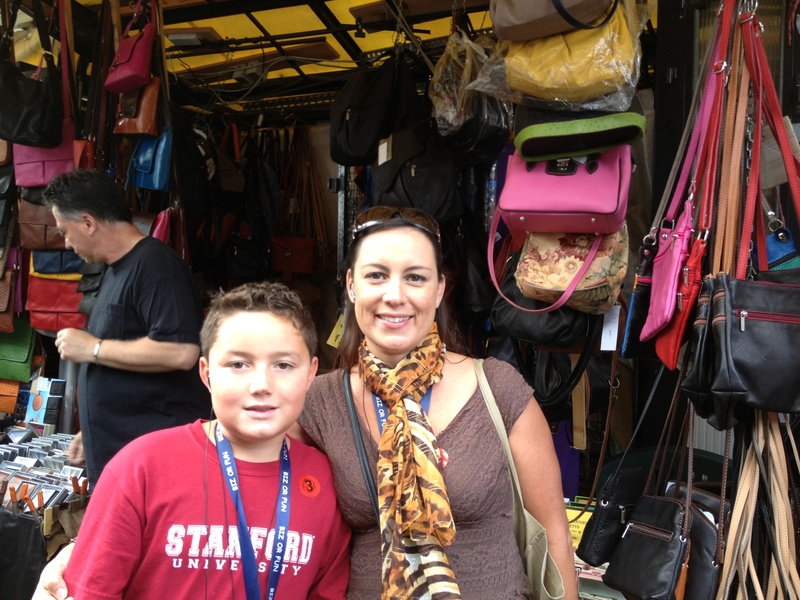 Browsing through the shops was fun and the kids each picked something small and inexpensive. The castle has two, large slides which I had read about but had difficulty finding. Part of the difficulty was not knowing the Spanish word for “slide” and trying to act it out for the security workers. 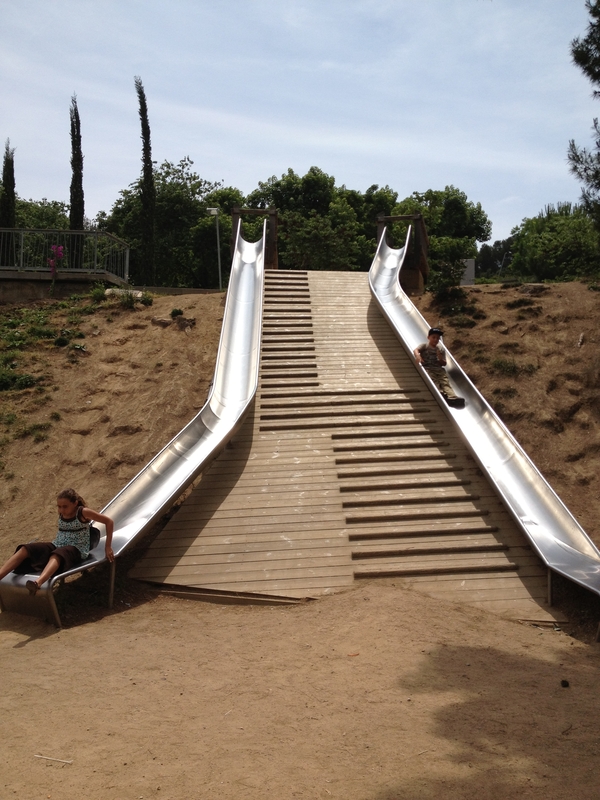 The Spanish word for slide is “toboggan” which may come in handy. The kids loved going down the slide and then climbing up all of the stairs to go right back down the slide again. The slides are located just below the castle. 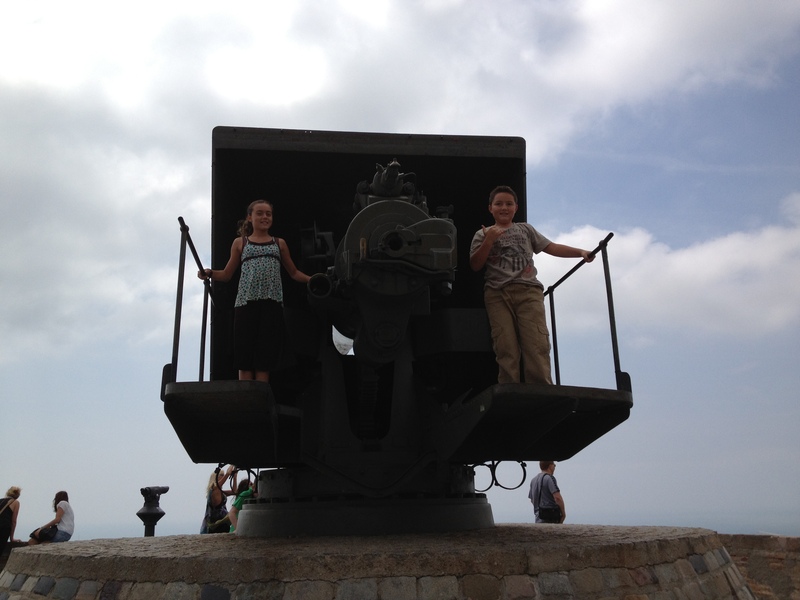 There are canons at the castle which the kids can stand and climb all over. This was quite fun for them as they read about the castle and how it was placed on the top of the hill to protect Barcelona from ships on the Mediterranean. They climbed right up and started the reenactments. It is a great photo opportunity as well, since these are real canons. $$ saving tips: Purchase the Barcelona Bus ticket on line and save 10% on the ticket. Bring your own food into the castle and have a picnic lunch there. The views are absolutely breathtaking and it is as if you are eating in a park overlooking the Mediterranean. The castle has tables and a large, open lawn to sit down and relax. The restaurant at the castle is pricey and most of there business is on catering for large groups. Take pictures of the signs and the history rather than purchasing the brochures and post cards. That way if your child chooses to write a report on the castle later, you will have all of the information for free.